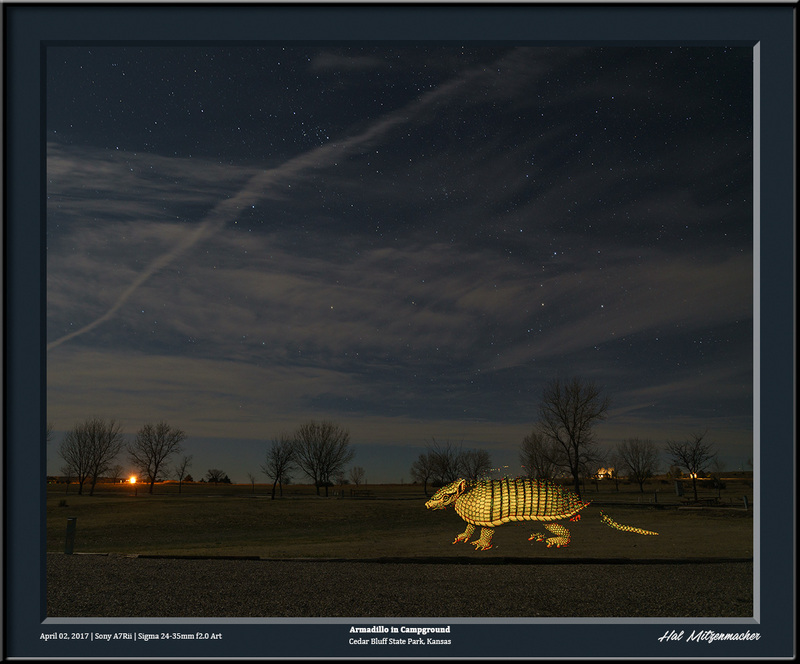 Night photography in the Ozarks can be difficult. 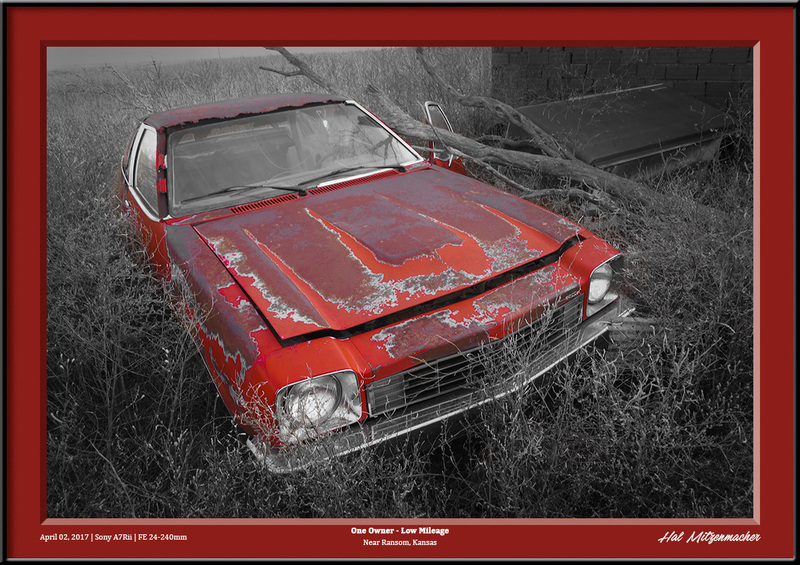 The narrow, winding, dark roads are hazardous to drive at night, and the abrupt falloff from lane edges to drainage ditches means there is usually no shoulder to park alongside the roadways. While there are areas in the Ozarks with dark skies, most of these areas are quite inaccessible (there are good reasons why the Ozarks remained a “semi-arrested frontier” for generations, the ruggedness of the terrain being one of them). 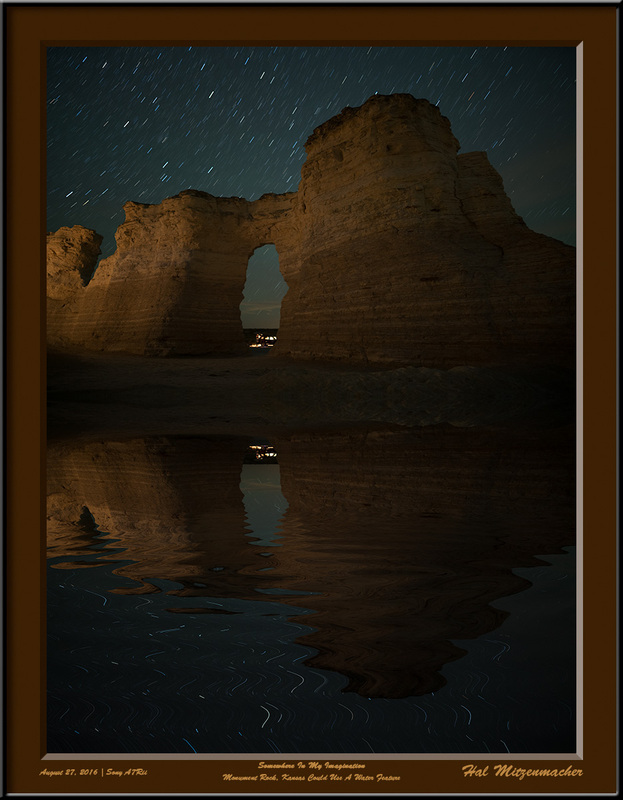 Combine this with the warm and humid air of the region, which creates lots of long exposure noise in images, and one can see why night photographers in the region are always on the lookout for alternate locations to shoot. 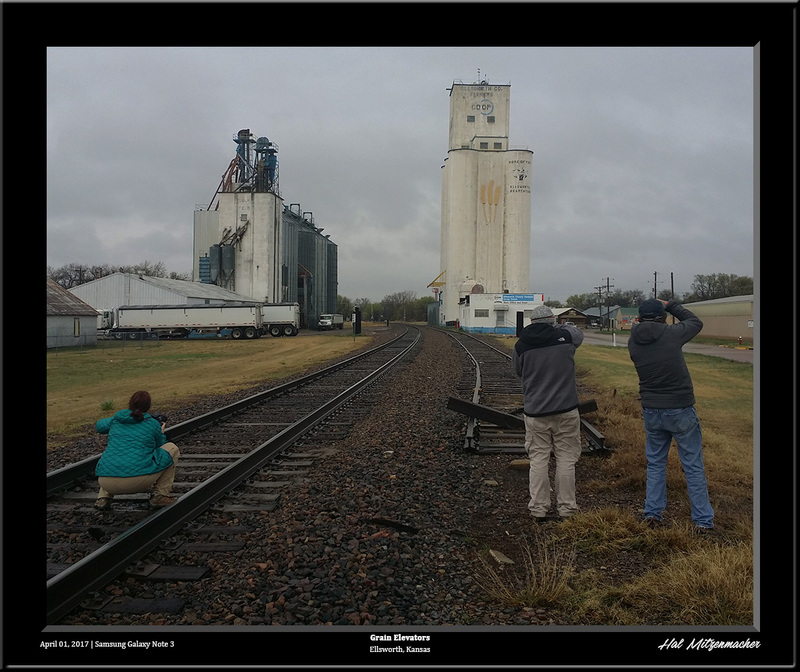 That is why, when Darren White posted an invitation to his friends to join him on a photographic scouting trip in Kansas recently, I immediately jumped at the opportunity. 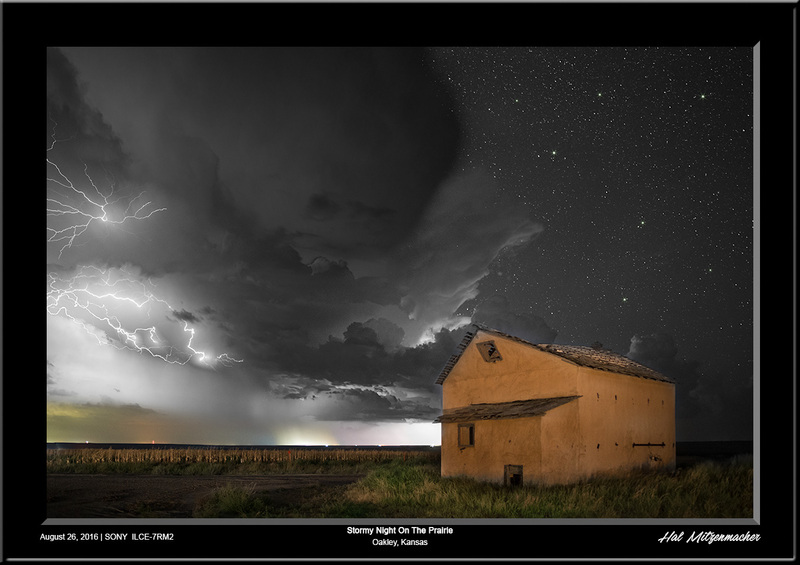 Not only does Kansas have reasonably dark skies, it also features many wonderful foreground subjects with easy access and wide-open horizons. And shooting with Darren is always inspirational and educational. What could possibly go wrong? Besides the weather, which rained or created foggy skies most of the trip. Besides the electrical system going out in my RV. Besides the water pump in the RV dying. Besides the hundreds of pounds of mud I pressure washed from every nook and cranny underneath my truck. These were merely annoyances compared to what I gained by participating in this scouting trip. While I do not have many night images from this trip due to the weather, we did manage to explore a trove of locations that will provide many, many night images in the future. Meanwhile, the photography I did manage to get in turned out OK, so I thought I would share some of the images and locations through this post. 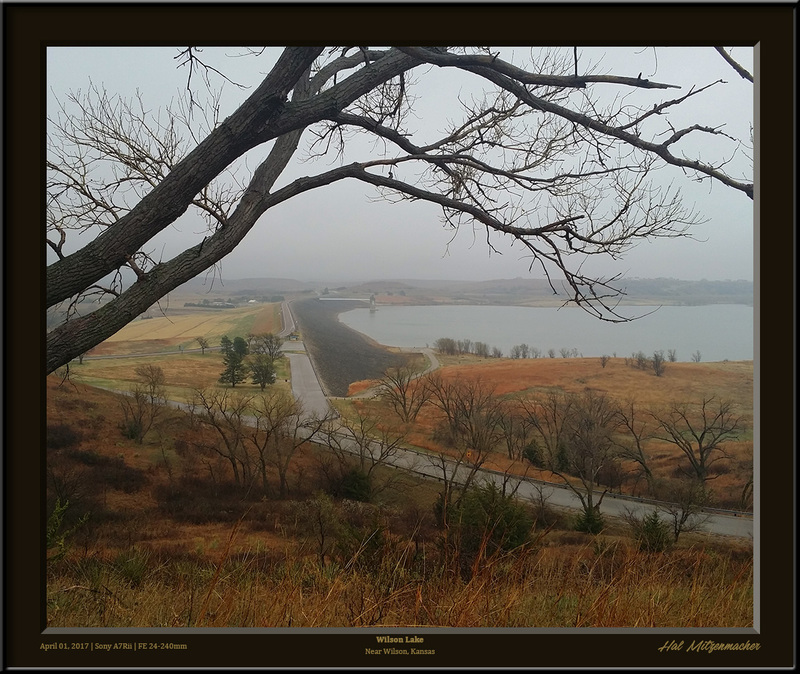 Day 1 was spent driving from the Ozarks to Cedar Bluff State Park, located at Cedar Bluff Reservoir in central Kansas. After a long rainy drive, I spent the night making repairs to the RV and resting up for the following day. 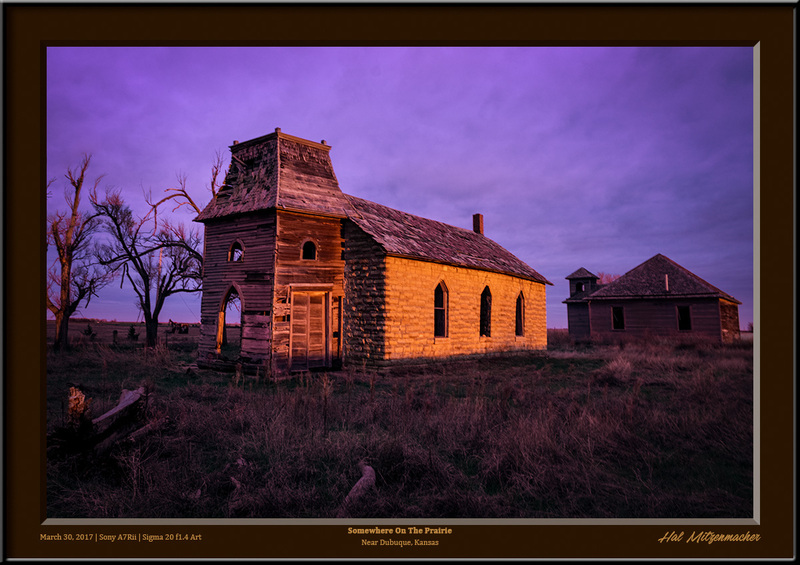 On Day 2 I met fellow photographer Mike Spivey at a location near Dubuque, Kansas, where we awaited the sunset in order to photograph this old church and schoolhouse, The sunset did not disappoint, and we were rewarded with some rich, warm tones to work with. It was here that we met Derek Ace, a photographer from Wisconsin, who joined us in shooting these structures. 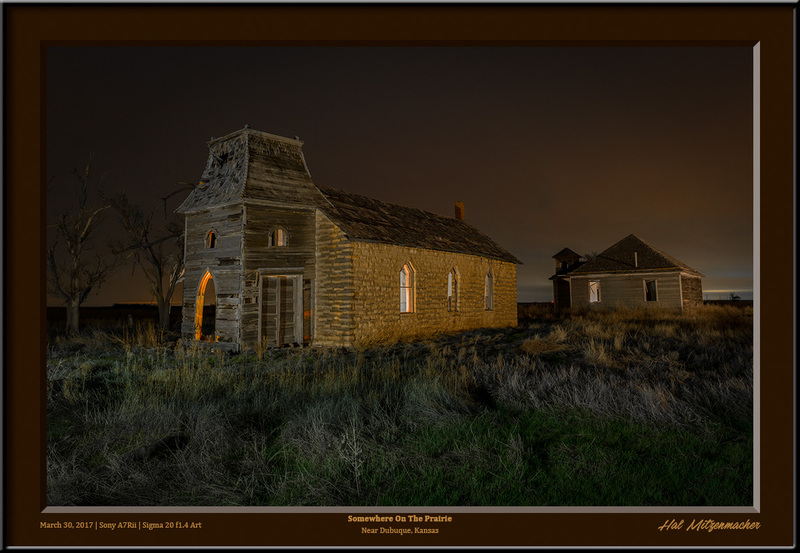 Derek had just arrived in Kansas after a long drive from Wisconsin, so he departed immediately after sunset to catch up on some needed rest, while Mike and I continued to shoot the old abandoned church until about 11:00 pm. It was pretty apparent that the Milky Way would not be making an appearance early the next morning due to the clouds, so I made my way back to camp at Cedar Bluff State Park. 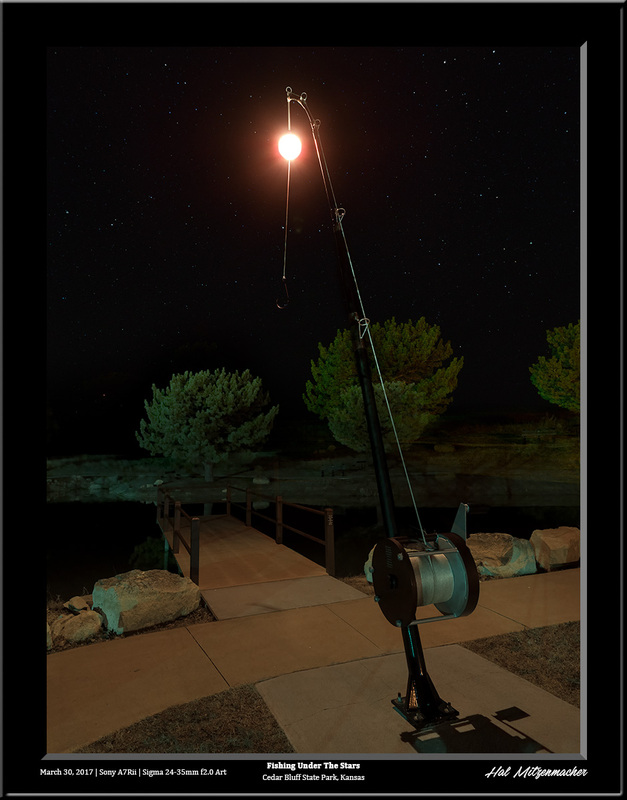 The sky decided to play tease with me – when I arrived back in camp, the clouds had completely disappeared, so I set up the camera to take star circles around this giant fishing rod & reel for a couple of hours, while awaiting the Milky Way core, which would be rising in the wee hours of the morning. I settle down in the truck to take a nap, and when I awoke, the area was engulfed in fog. No Milky Way again. 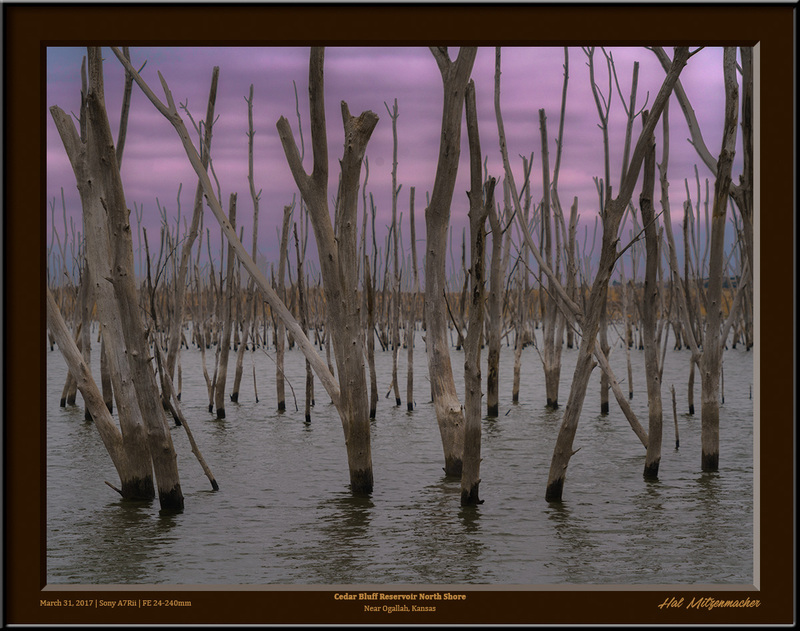 Several photographers met up on this, the first “official” day of the scouting trip, at 4:00 pm at Cedar Bluff State Park in central Kansas.. Included were Darren, Bob, Mike, Angie, Shari, and myself. Our first order of business, after getting acquainted, was to explore both the south and north shores of the Cedar Bluff Reservoir. The south shore is generally flat, but contains areas full of the trees that stick up out of the water. The north shore, on the other hand, has nice areas of rocky bluffs that are quite rugged and photogenic. I think that the Cedar Bluff area has great potential for night images when the sky and weather are cooperative. Our intrepid group of explorers departed camp at 5:00 am, hoping to catch the sunrise at the Excelsior Lutheran Church, a beautiful structure near Wilson, Kansas, located in the middle of the Smokey Hills Wind Farm. The rains of the previous night and that morning made the roads too muddy for some of the vehicles in our caravan, so we toured around the area instead. Some locals informed us of a couple of attractions nearby, so off we went to check them out. Above is a view of Wilson Lake, near Wilson, Kansas. It has a reputation as a great bass fishing lake, and appears to be a location where the Milky Way might be captured, given the right conditions. 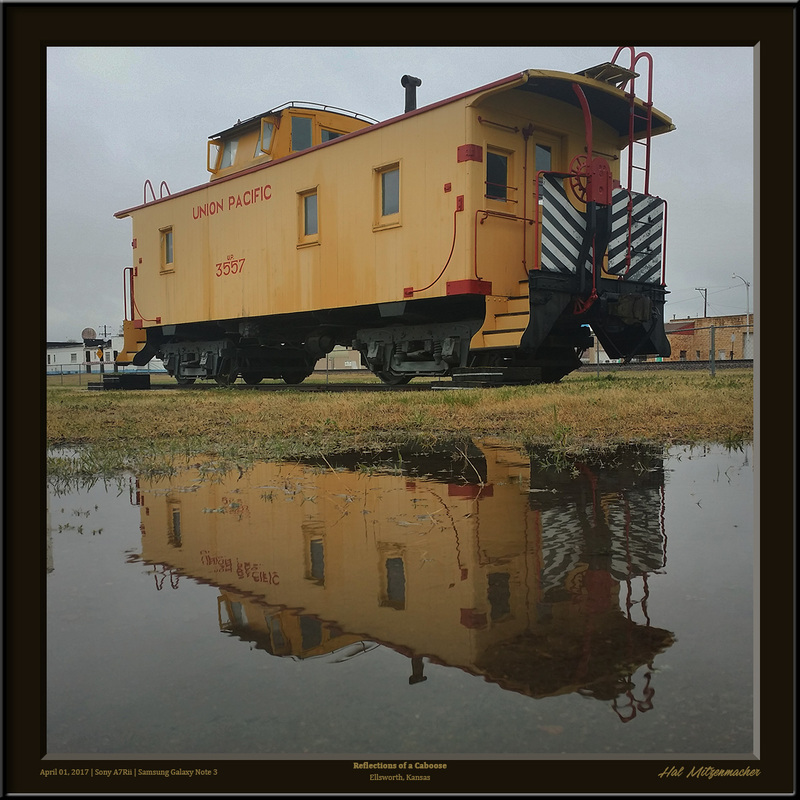 Because of the extensive rains that had occurred, there were puddles everywhere, so what better time to practice my puddleography skills using my cell phone camera. 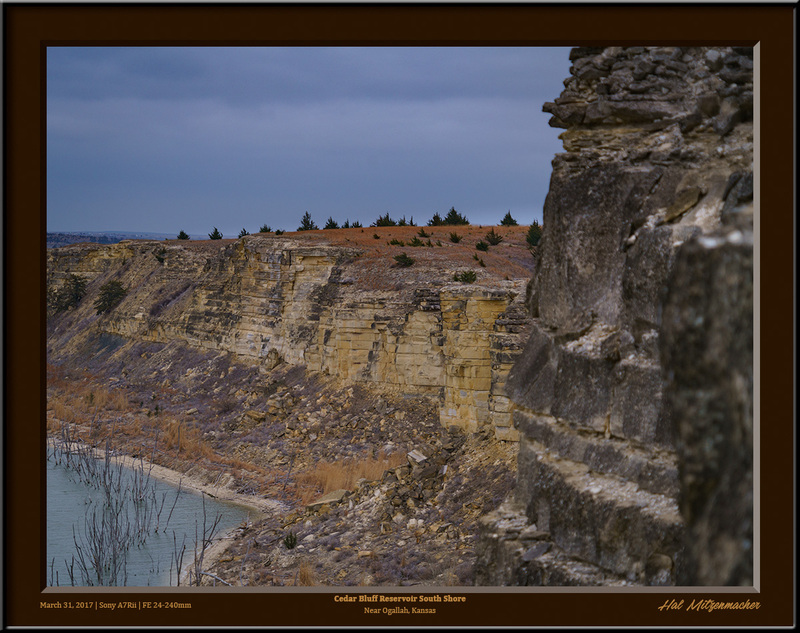 Continuing on from Ellsworth, we explored Fort Harker, Lyons, Ellinwood, Great Bend, and Ness City before heading back to base camp at Cedar Bluff State Park. 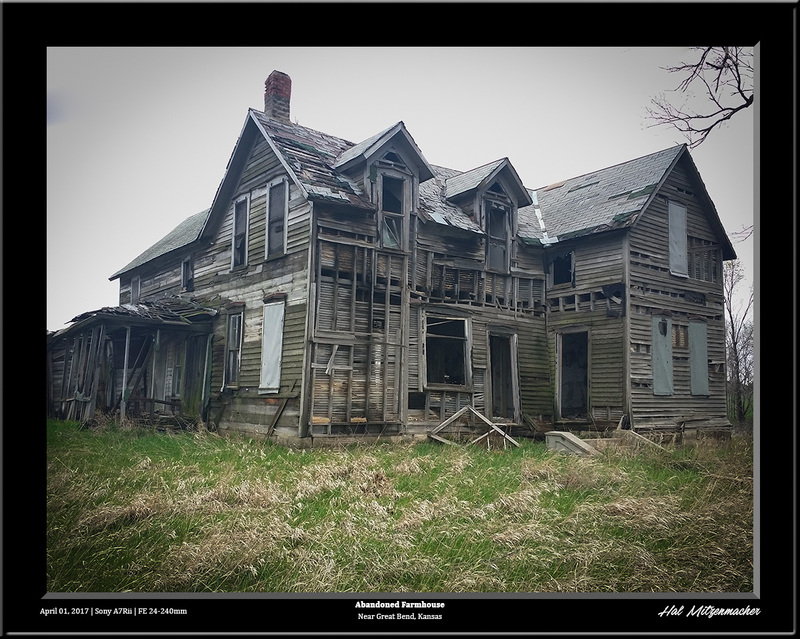 There were several abandoned structures along the route, and I compiled a decent list of night photograph possibilities for future trips in my PlanIt! for Photographers Pro software. One more member of our group, Shari had headed home Saturday, so now there were just the three of us left, Darren, Bob, and myself. 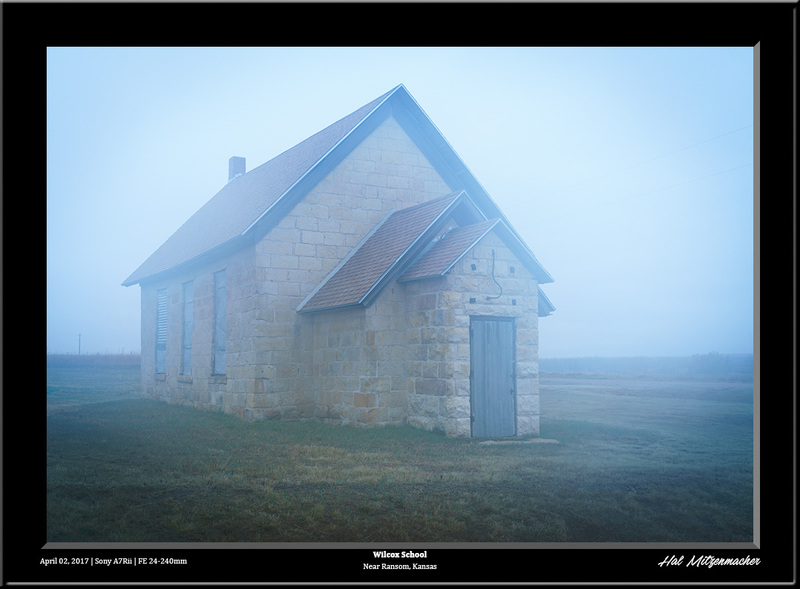 We decided to meet up for sunrise at 6:00 am Sunday morning to photograph the Wilcox School, about 15 minutes south of Wakeeney, Kansas. The sun was not very cooperative with our sunrise plans, so I attempted a few “faux fog” shots of the schoolhouse, which Darren had just taught me. What I learned is that I had wasted my money buying a Tiffen Double Fog 3 Filter. Just breathing on the front lens element provides a far better result, and you can look through the live view and snap the shutter when the fog effect is just to your liking. An interesting technique I will certainly employ from time to time in the future. 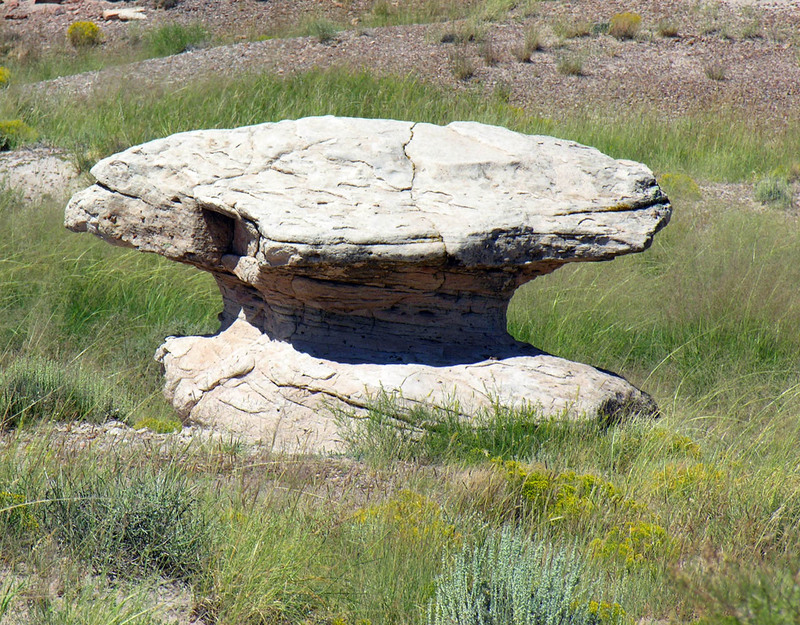 It was now time to head over to Monument Rock and Chalk Pyramids for some daytime shots of the area, but not before stopping to look at some interesting sights along the way. 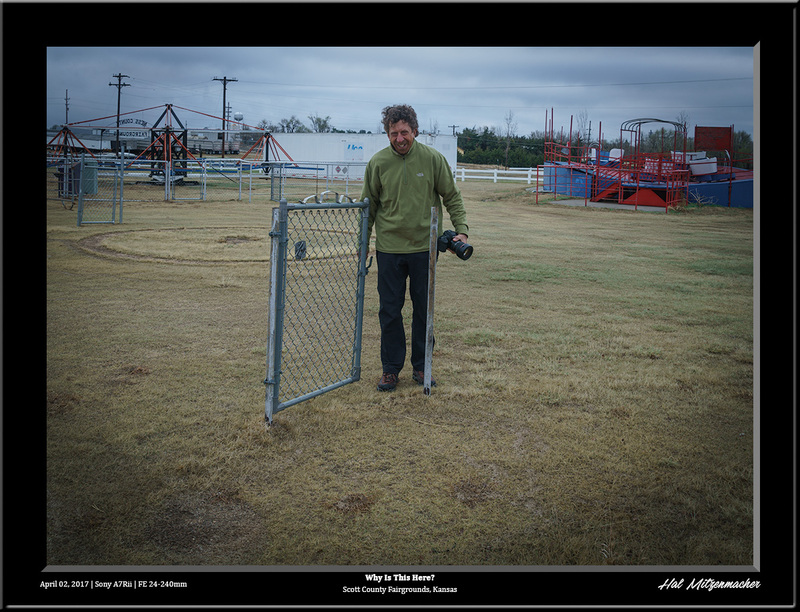 At the Scott County Fairgrounds, in Scott City, Bob and I were at a loss to explain the reason for this gate. It reminded me of the scene in Blazing Saddles, where the army of bad guys stop in the middle of the plains to pay a toll at an isolated toll gate! 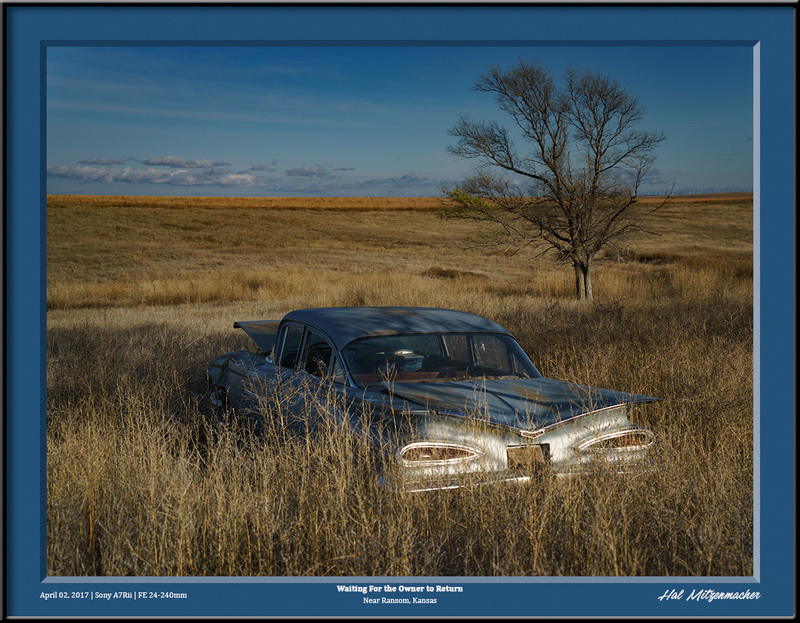 As a reminder of how transitory some subjects can be, here is a shot taken on another of the trips to Kansas that Darren was so kind to organize in August of 2016. A group of four photographers (including myself) spent hours at this old abandoned grain shed located on Jayhawk Road as lightning storms raged all around us. The photo opportunities that night were beyond amazing, and while I know that was a stroke of luck not likely to be repeated, I was still looking forward to photographing from this location again. Alas, we discovered as we drove past this structure that the roof, with the beautiful overhanging eaves, had collapsed! Oh well, I’m just glad I had the chance to photograph this building when I did. 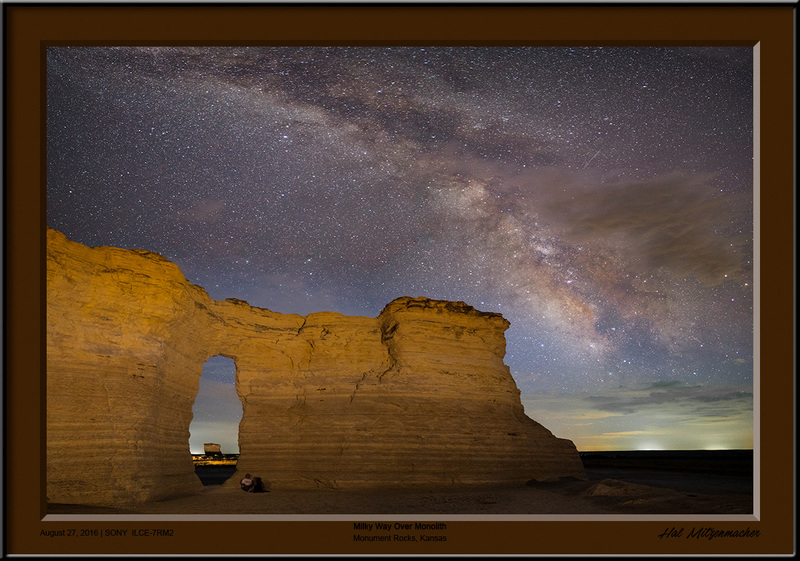 At this point, I would like to have said that I took these images on this scouting trip to Monument Rock and Chalk Pyramids, but when Darren contacted them they informed him the area was unavailable for special permission to photograph at night, due to calving season. 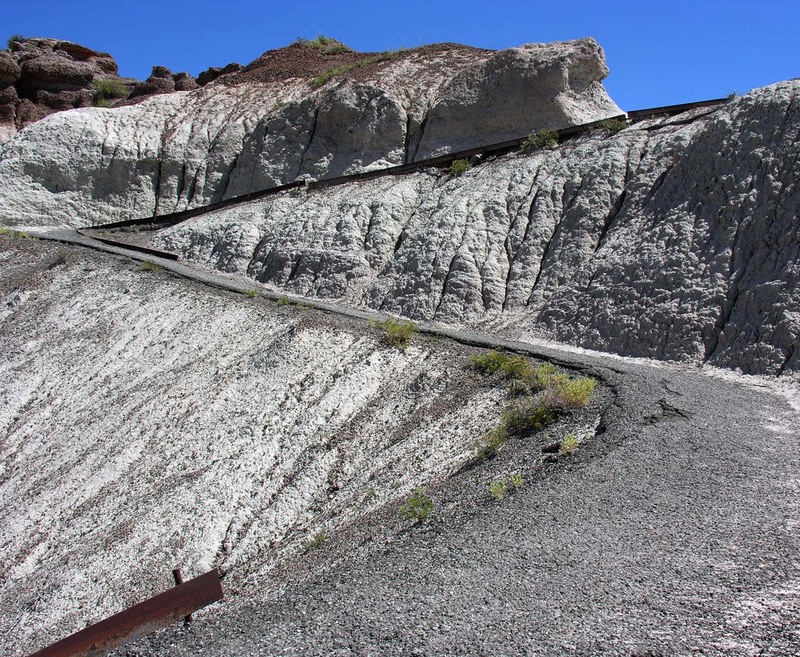 This wonderful geographic feature is located on private property, and the owners have been quite generous in allowing the public to enjoy the area. The rules that are posted are simple to comply with, and if you contact them beforehand, they will try to accommodate your visit request if at all possible. 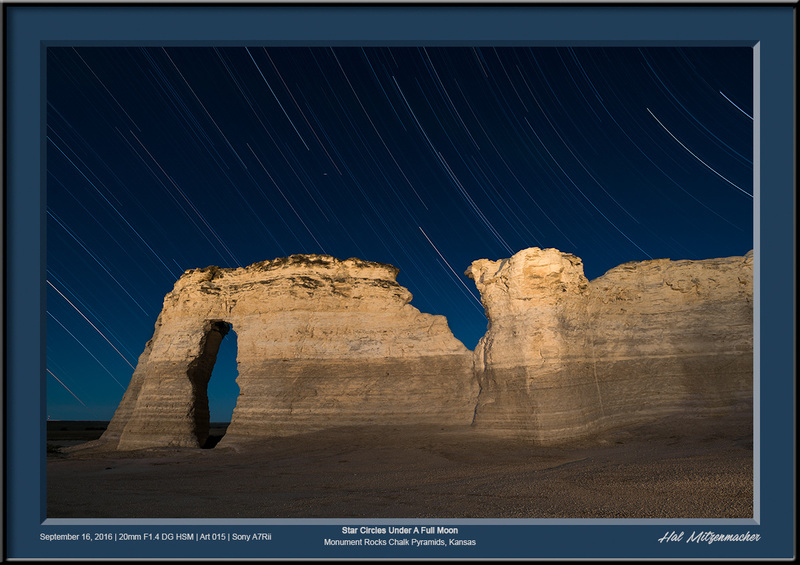 I urge you to do your part to help keep Monument Rocks available for all of us to enjoy in the future. 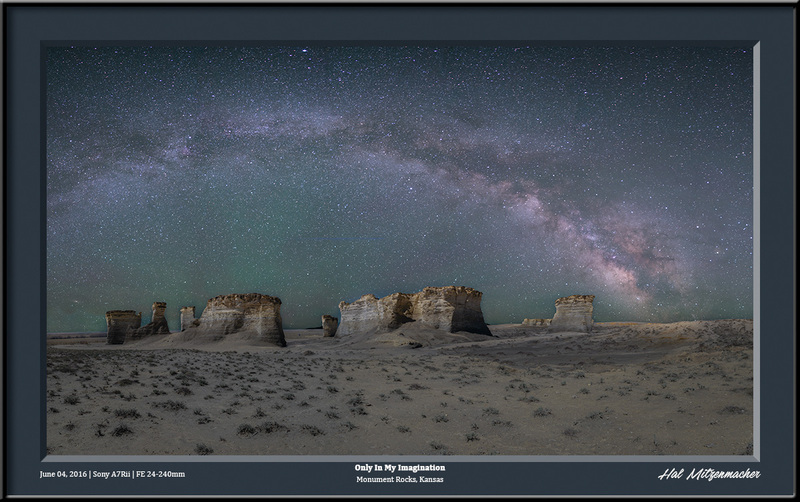 I was extremely hopeful to get a Milky Way panorama over Monument Rocks this trip, but due to circumstances beyond my control, I could not. So I faked one using a composite of a foreground panorama taken on this trip to Kansas, and a Milky Way sky taken last year in Wyoming. I’m allowed to imagine, aren’t I? After photographing Monument Rocks we headed off to explore some of the small towns along Old Highway 40. 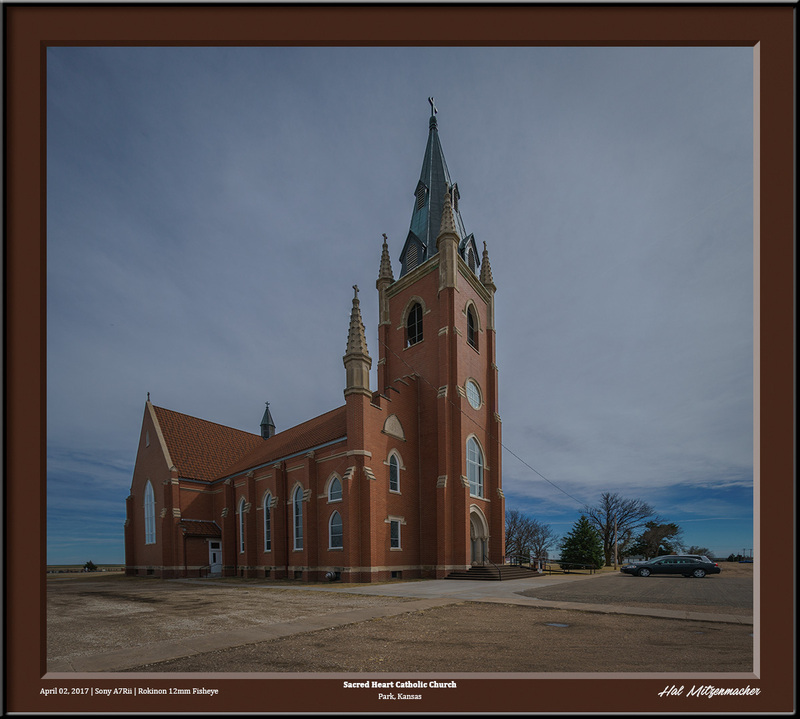 In the town of Park, Kansas (population 129) we discovered a Catholic Church that I’m sure could easily hold 10 times the population of Park. This seems to be a common feature in small Kansas towns – huge churches relative to the size of the town. From Park, Kansas we continued on to the town of Collyer, where the main attraction seems to be the Pontiac Bar and Grill, even though it is currently out of business. It must be sorely missed, because, as Darren has pointed out, four locals inquired (hopefully) as to whether we were there to buy the bar! In case you were wondering, the other half of the Pontiac (it looks to be vintage 1953) is mounted on the rear of the building. 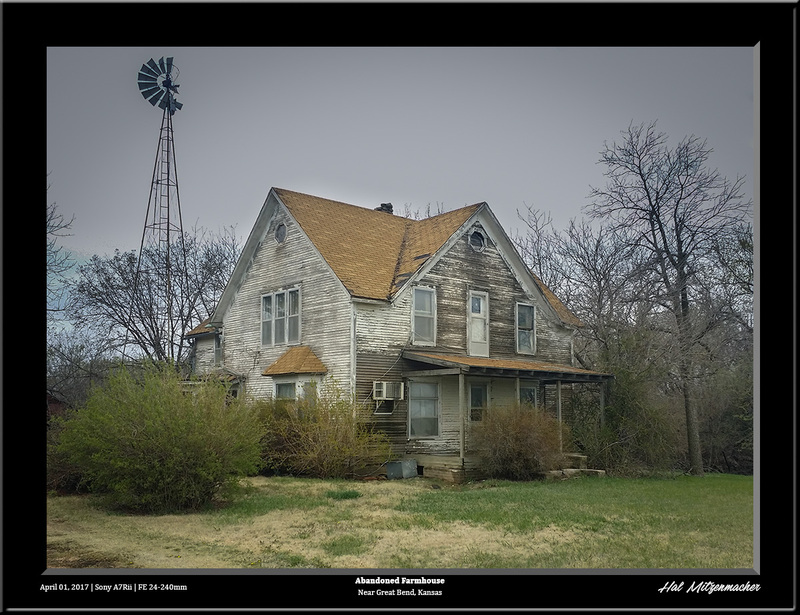 After finishing up in Collyer, we headed back to Ransom, Kansas to shoot sunset pictures of the old schoolhouse that we had visited earlier in the morning. Near the school was an old abandoned homestead, which included some interesting finds, such as the old vehicles scattered around the property. 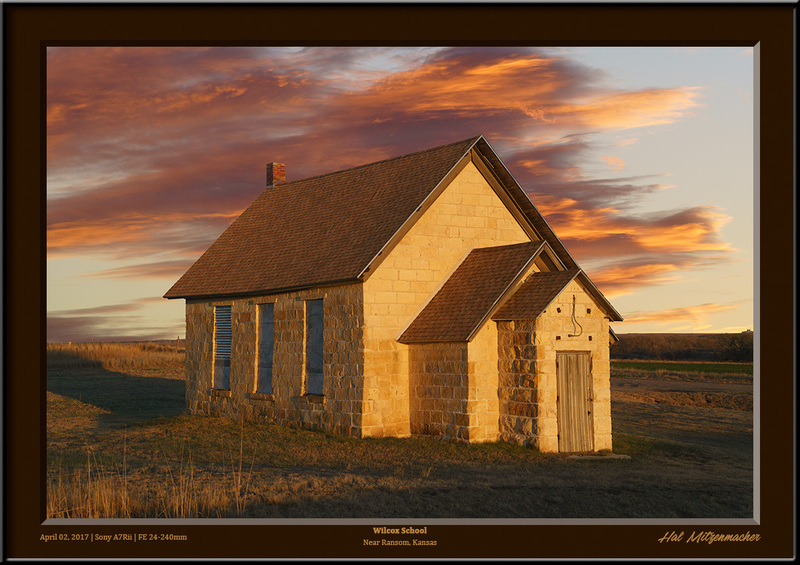 We enjoyed some nice glow from the sunset, and it provided us with some really nice light to work with the schoolhouse. After sunset we headed back to Cedar Bluff State Park, where we intended to nap and await the rise of the Milky Way core early in the morning hours. Rather than napping, I decided to try out a new (to me) light painting device called a Pixelstick. All was well, until this giant armadillo chased my into my camper for the night. When the alarm went off at 2:00 am to signal that it was time to go shoot the Milky Way, I popped my head out the door and discovered that fog had completely enveloped the area. Darren and Bob decided to start heading for home, and I decided to get a good night of sleep. The next morning I checked the weather forecast, and it wasn’t looking good, so I decided to head on back to my neck of the woods in the Ozarks. All in all, it was a successful trip. I did not get any of the Milky Way photographs that I had hoped for; in fact, I did very little night photography on account of the weather conditions. But the purpose of this trip was to scout out areas of Kansas that might be conducive to night photography at some future date, and on this count, the trip was very successful. I have shared some of the sites we visited, but have saved some of the best for later, when I can go back and photograph them the way I envision the scenes in my head. Meanwhile, it was a fun, if not tiring trip, and I met some interesting new friends to boot! The Louisana Purchase, and the subsequent westward exploration and expansion of the United States. The first civil government west of the Mississippi River. Approaching the Arch on foot from the north, one immediately notices the similarity to the Washington Monument, althought the illusion soon disappears as you move to the side of the towering arch. The actual size of the arch cannot be fully appreciated until you approach the very base and gaze in an upward direction. You soon find yourself jockeying for a suitable position to view the entire arch at one time. Alas, the dimensions of the arch are so vast, and the field of vision of our eyes so comparatively narrow, we come to realize that from this close proximity we can only view a portion of the arch with each gaze. 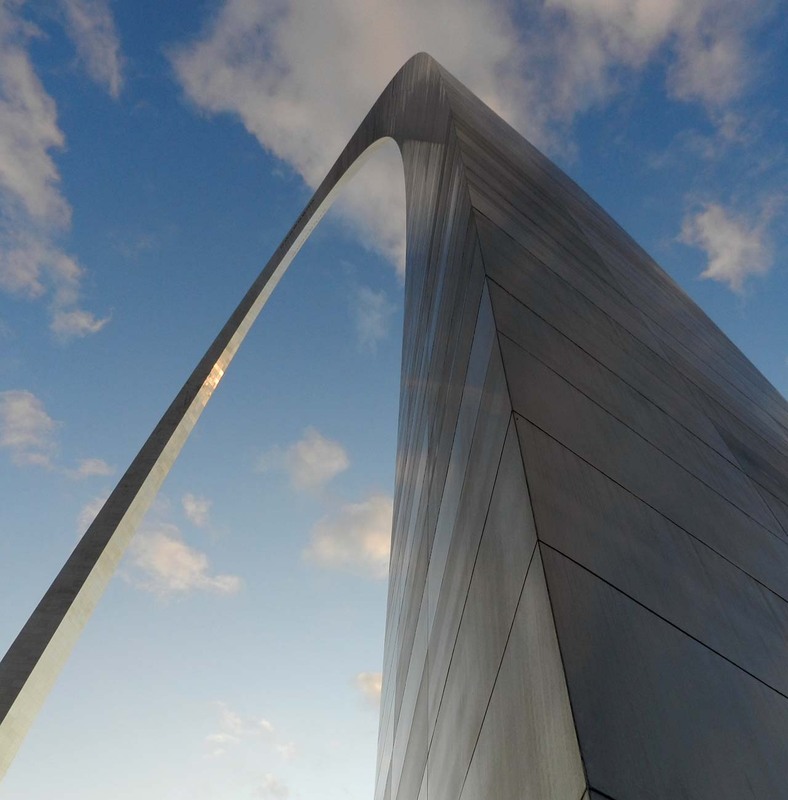 The height of the arch measures 630 feet, which exactly matches the 630 foot width of the arch at its base. 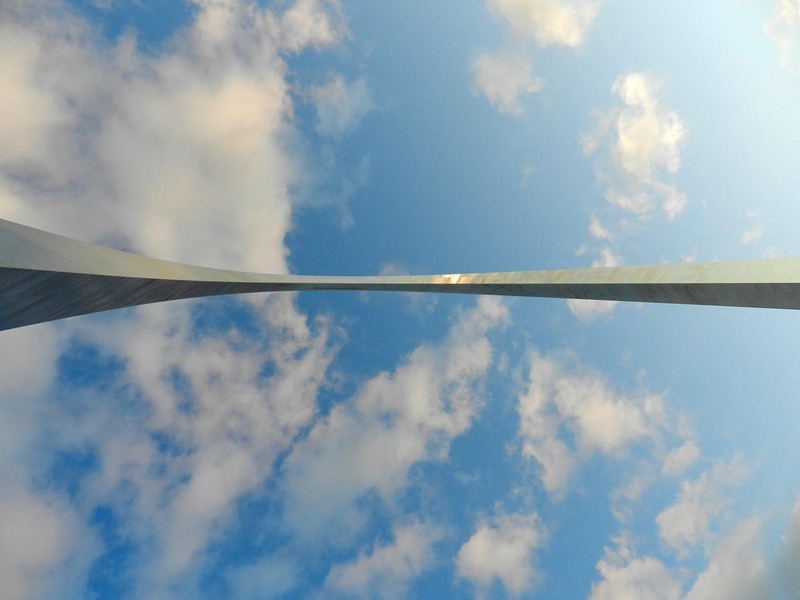 It is quite an experience to stand directly underneath the apex of the arch and look up – the top of the arch seems far, far away! It occurs to me that this might be the only time in my life that I have stood directly underneath any structure this tall! 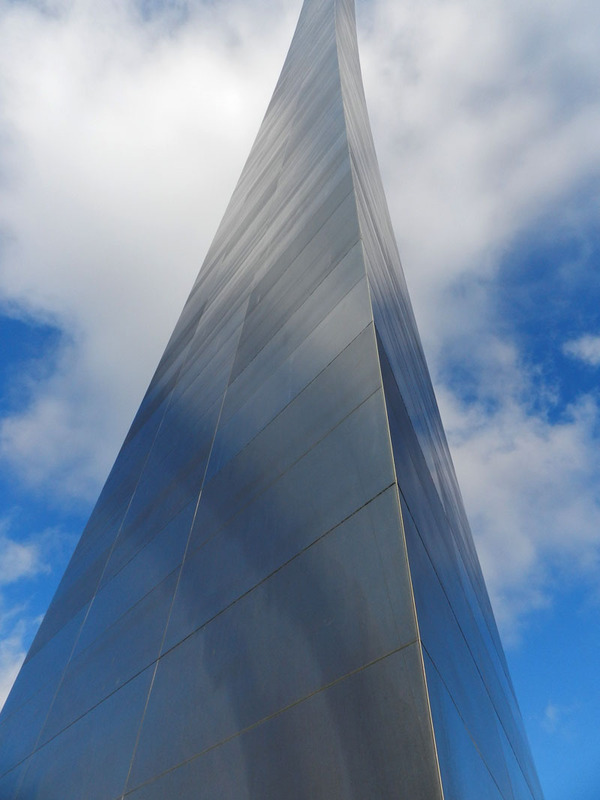 So help me out – if you can think of any example of a structure that a person can stand under that exceeds the height of the Gateway Arch, please leave a comment explaining where. 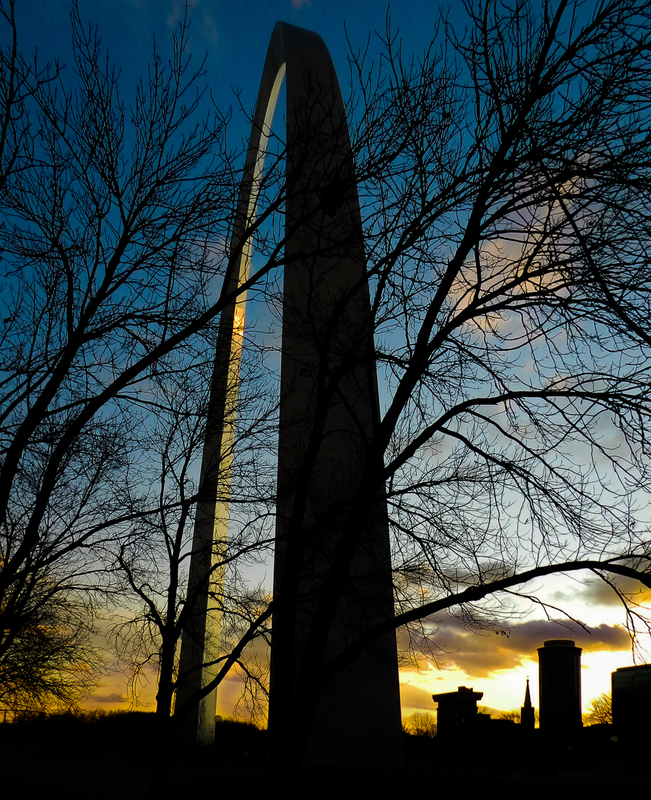 After standing underneath the arch, you might decide to ride the tram to the top of the Gateway Arch. 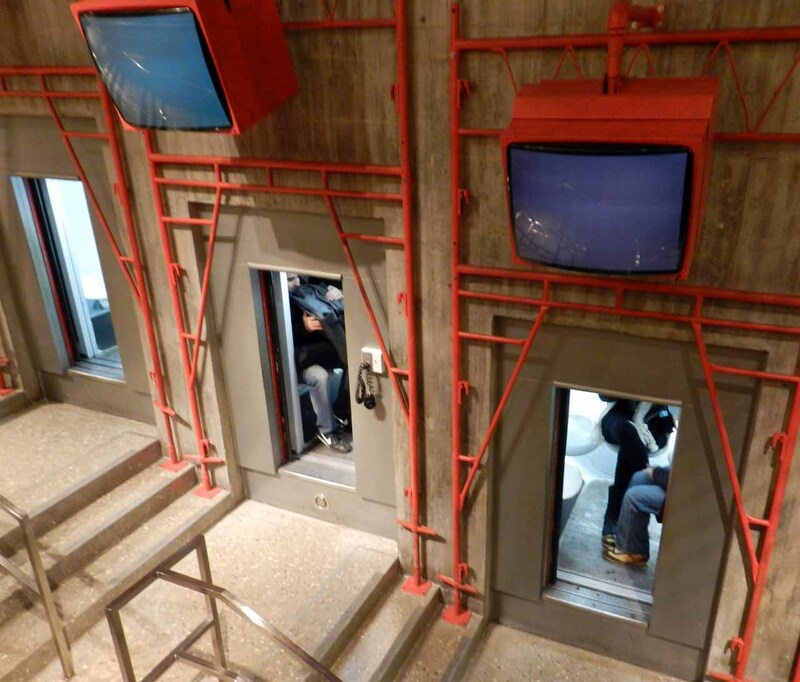 After purchasing your tickets for the tram, you will make your way to the tram loading station, where you will enter a tram pod for the ride up the inside of the arch. There are eight tram pods on the north leg of the arch, and eight pods on the south leg. 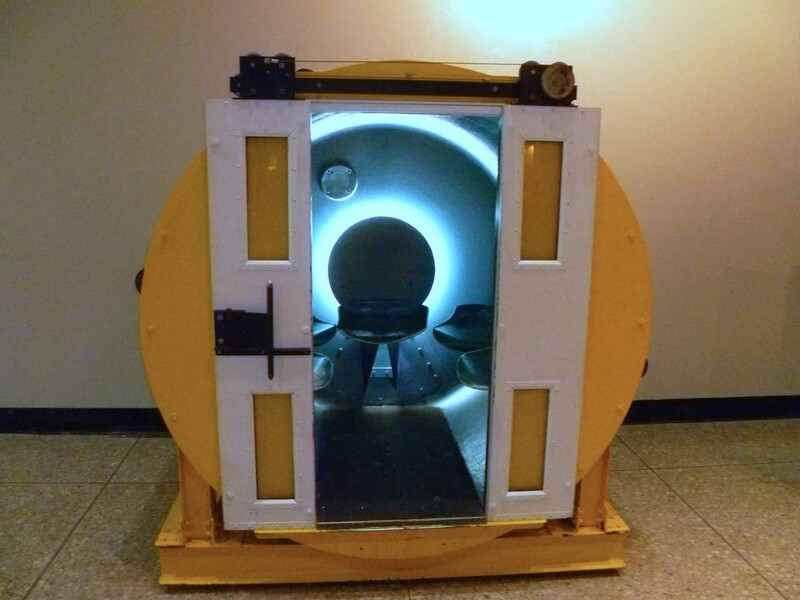 Each of the pods can hold up to five people. As you can see from the photo above, the loading zone for the tram is fairly level on the horizontal plane. Yet the tram must travel up an arch leg that is almost straight up on the vertical plane. How is this accomplished? The tram, consisting of eight pods, is not a single structure, but rather a row of eight independently suspended units, as seen above. The pods are in lateral alignment along the horizontal parts of the journey, and stack up, one above the other on the vertical portion of the ascent. 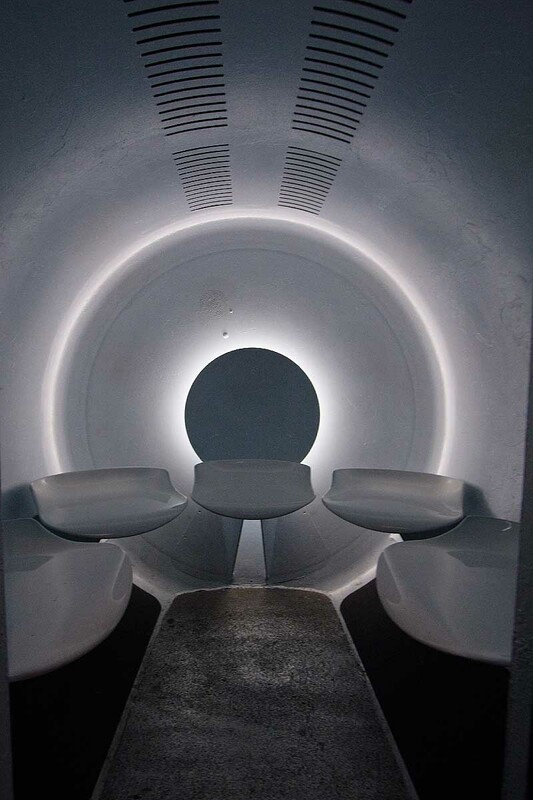 This is what the interior of the tram pod looks like. In the off-season, you may end up with a pod to yourself, but each pod holds up to five passengers, albeit snugly. 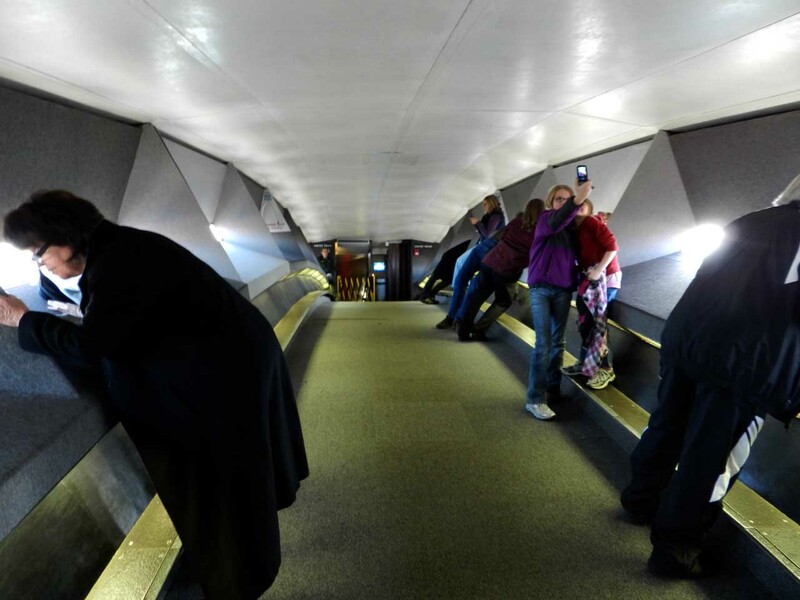 The trip to the top of the Gateway Arch takes four minutes – the trip down, three minutes. Once at the top of the arch, the tram lets you off at the observation area, where rows of windows allow you to see the surrounding countryside for many miles in each direction. 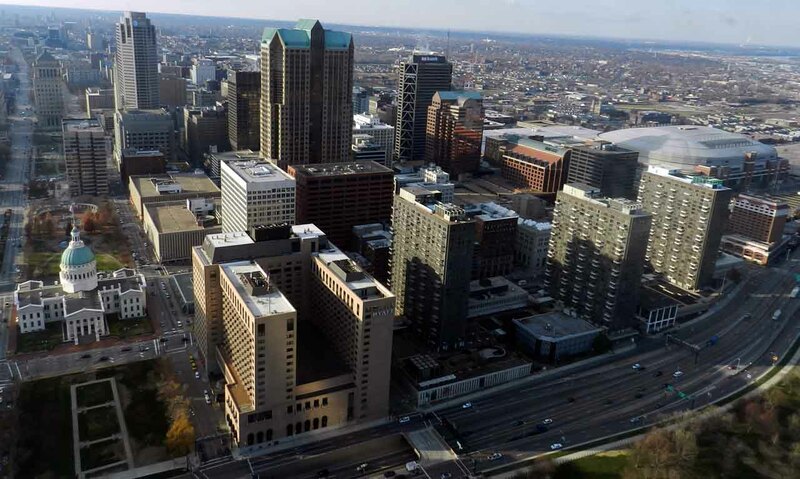 Upon gazing out of the observation windows, one is immediately struck with the realization of how high the arch towers above the St. Louis skyline. 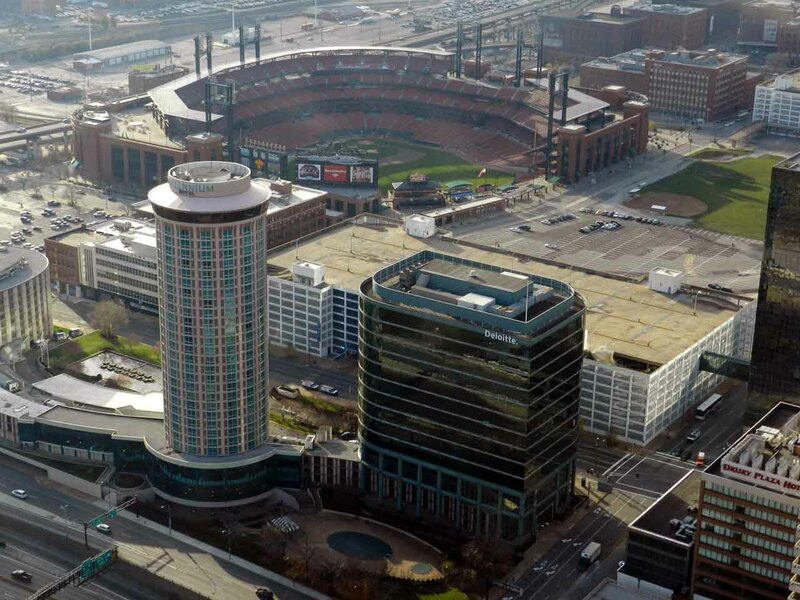 To get a sense of size, the enclosed football stadium on the right-hand side of the photo above is the Edward Jones Dome, the home of the NFL’s St.Louis Rams. Directly to the west is the Old Courthouse, which is also part of the Jefferson National Expansion Memorial. 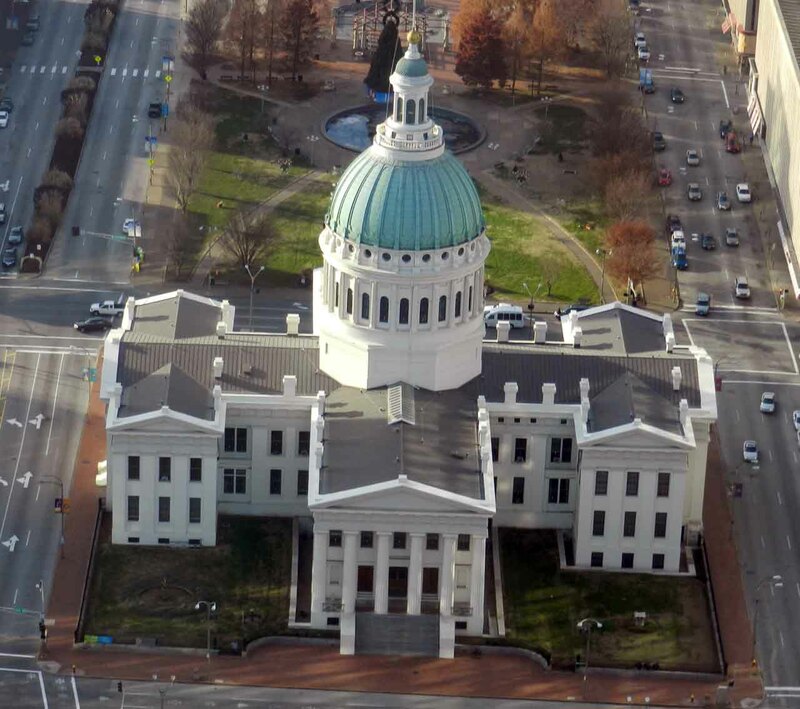 Most notably, this was the court of original jurisdiction in the historic Dred Scott v. Sandford case, in which the U.S. Supreme Court held that Africans brought to the United States as slaves (or their descendants) were not protected by the United States Constitution, and could never be citizens. To the southwest one can see Busch Stadium III, completed in 2006 and home of MLB’s St. Louis Cardinals. To the east one can see the mighty Mississippi River. 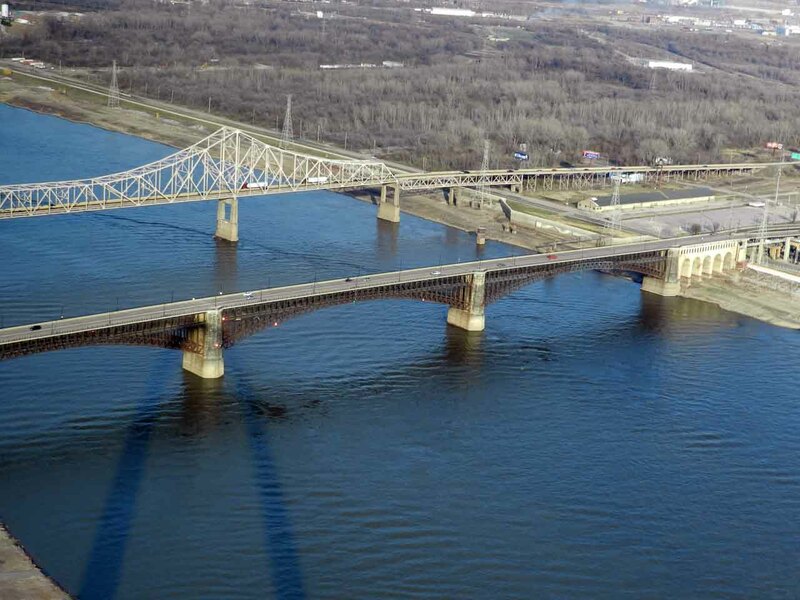 The color of the Mississippi River is not as blue as this photo would suggest. 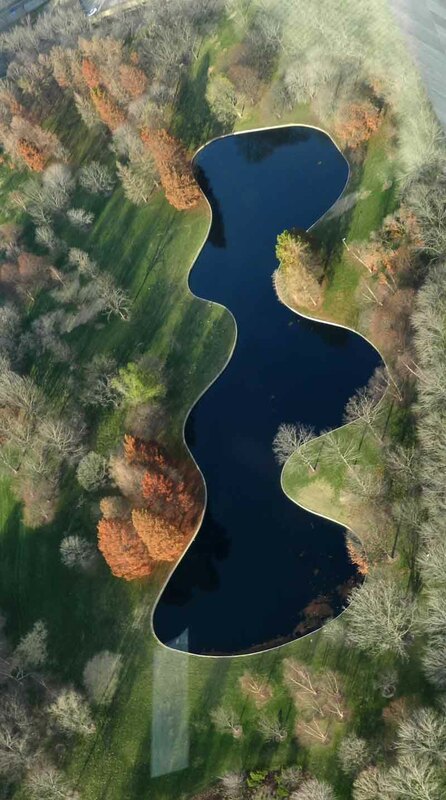 This is simply a reflection of the blue sky above; from a land-based perspective, the river is typically brown. Looking directly below the arch to the northwest, lies the first of two large reflecting pools. 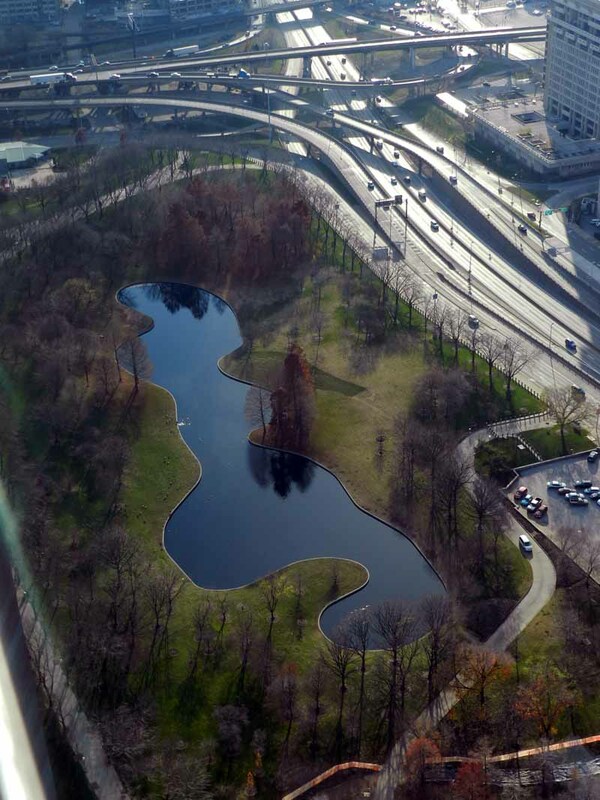 The second reflecting pool lies immediately below the arch to the southwest. 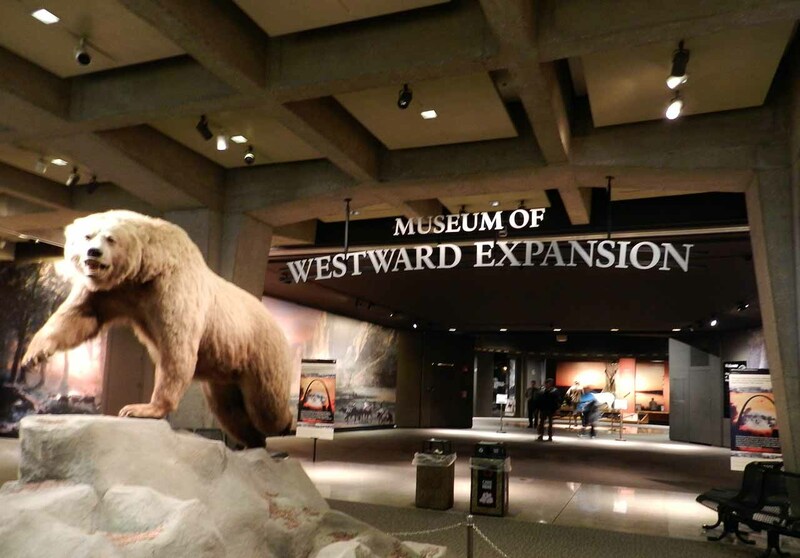 Housed below the arch in an underground facility is the Museum of Westward Expansion, documenting the growth of the United States, from inception to the present, with an impressive collection of artifacts and exhibits. There are two theaters located within the monument. 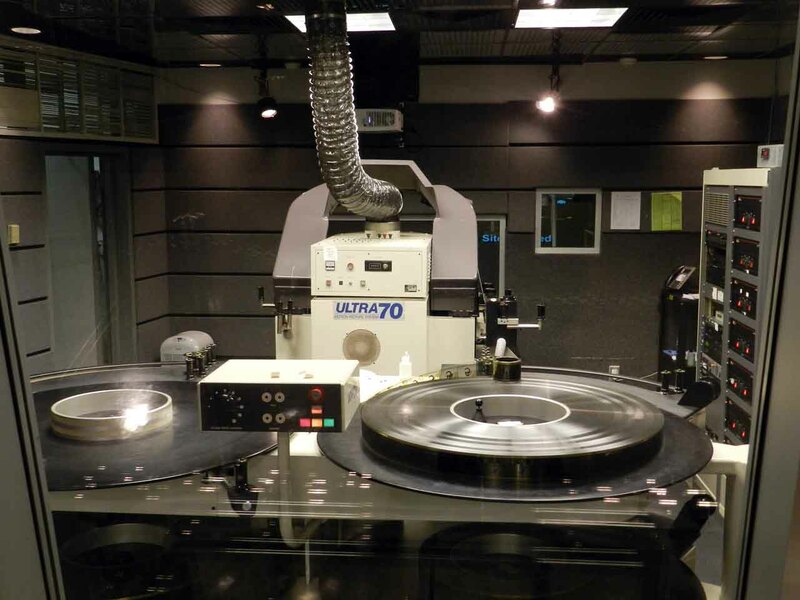 One theater shows a documentary film in which you learn how the Gateway Arch was constructed. The second theater shows an IMAX large screen format film chronicling the expedition by Lewis and Clark to document the western territories of the United States. Both films are very well done, and worth the time to see. 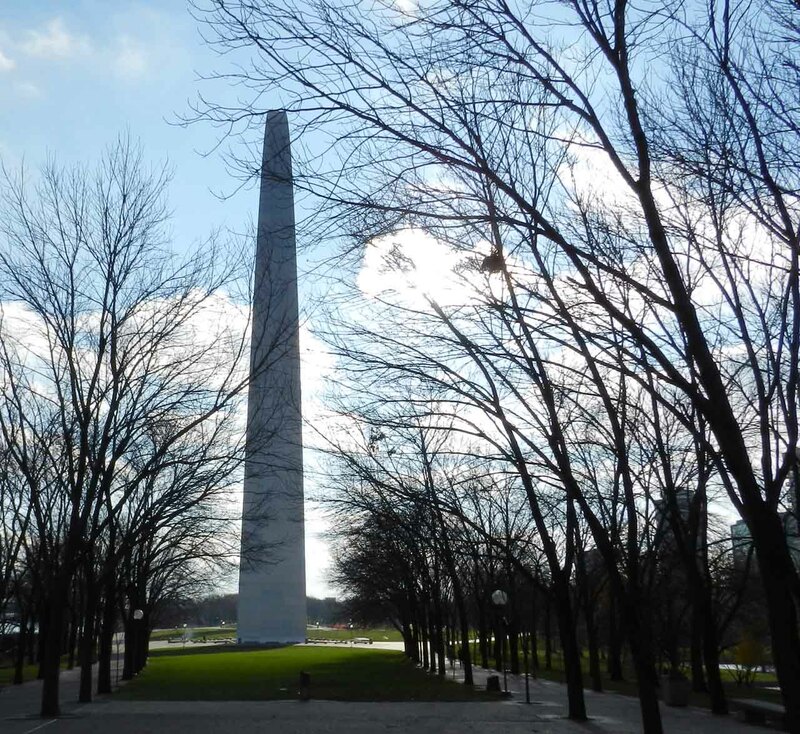 All-in-all, the time spend exploring the Jefferson National Expansion Memorial is time well-spent. If I didn’t think this was worth visiting, I wouldn’t have posted about it! I have a goal of visiting every major attraction along (or close to) the famous Route 66 within my lifetime. Why this is, I couldn’t tell you. Never-the-less, I plug away at it. 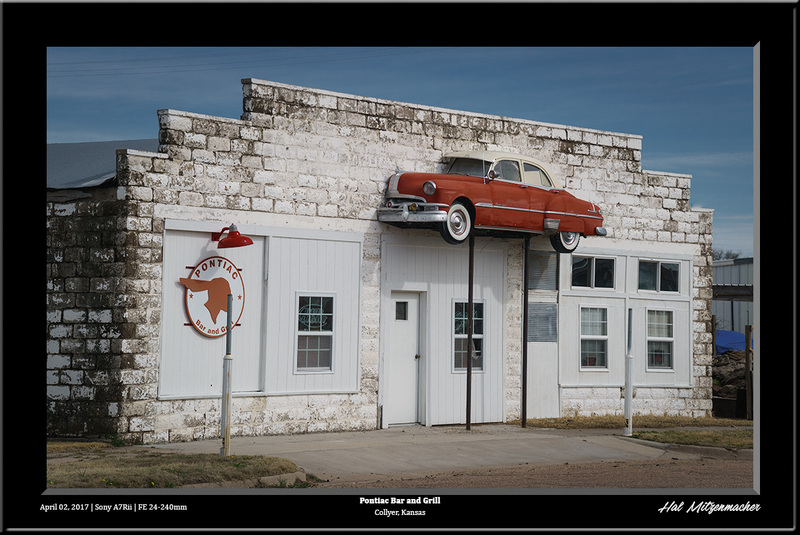 So here is yet another Route 66 attraction that is well worth taking the time to see if you happen to be traveling along Interstate 40 in northern Arizona. 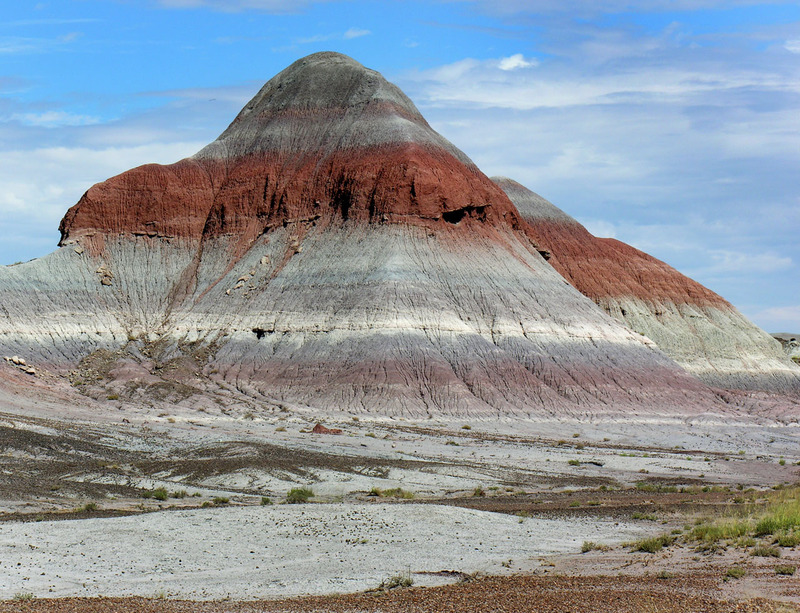 I’m referring to the Petrified Forest National Park located within the beautiful Painted Desert of Arizona. 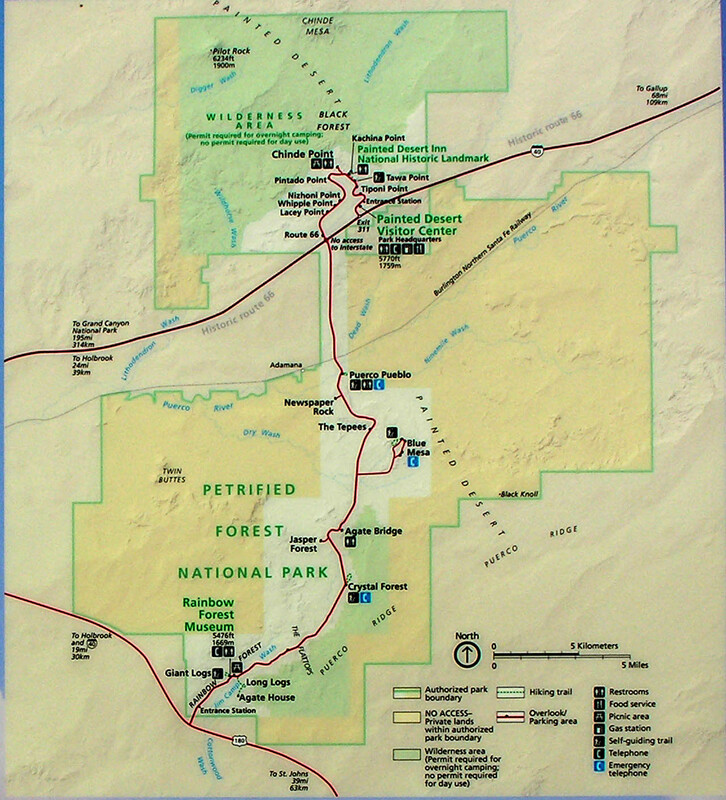 This map shows the outline of the park, along with the major features contained therein. You may notice that visiting the park, and driving along the main park road will not add a major amount of time to your east or west-bound travel along the interstate. 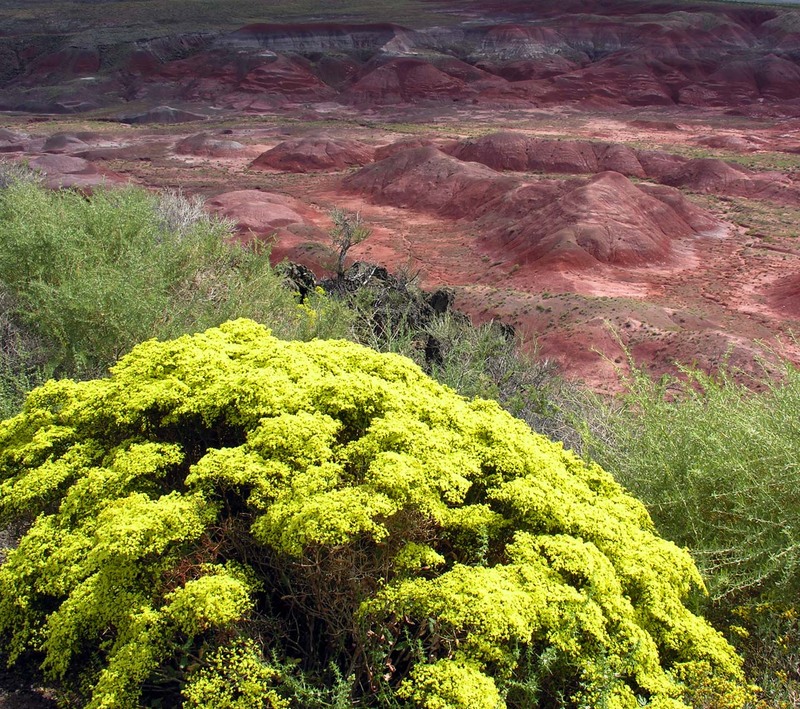 There is a lot to see within the park, however, so you may want to allocate sufficient time for hiking and sightseeing during your visit. 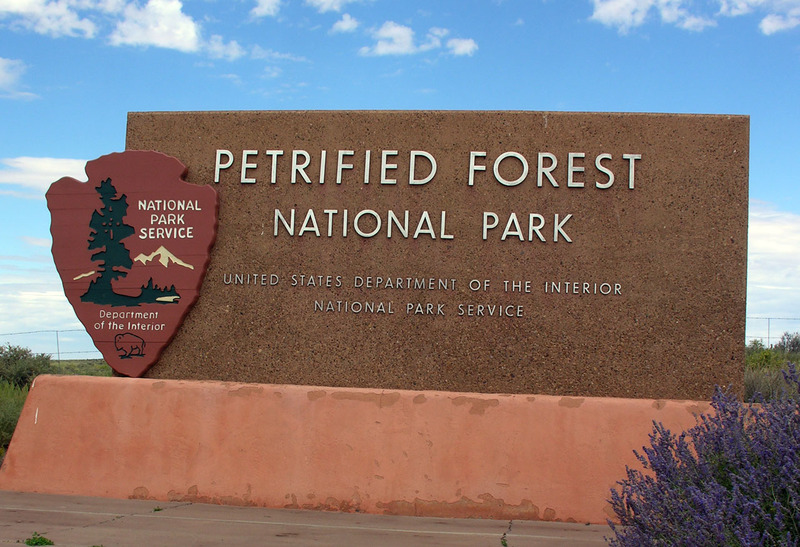 If you are west-bound on the Interstate, the first thing you will encounter as you divert off the main road is the visitors center, where you can obtain information about the park. The visitors center is exactly what you might expect, so I have not included any photos of it in this post. 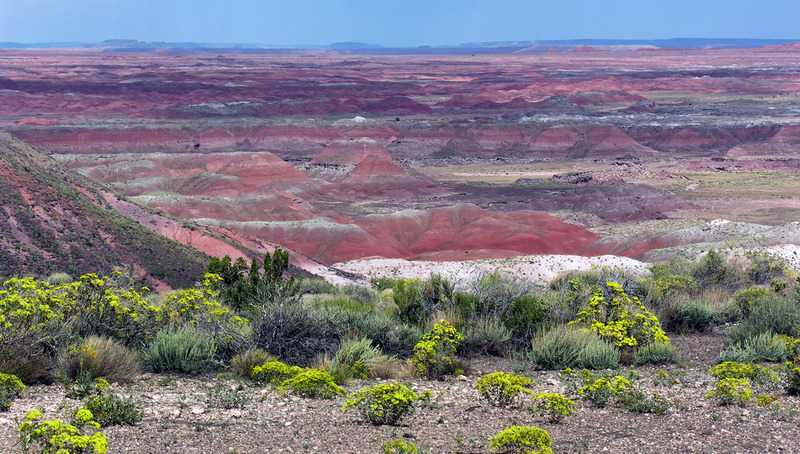 After paying the entrance fee at the park entry kiosk, the first thing you encounter along the park road are overlooks from which you have excellent vantage points of the spectacular Painted Desert. If you happen along this route at the right time of the year, wildflowers abound, adding a colorful touch to the already beautiful scenery. As you continue driving, you are rewarded with views of the desert in all directions, each view seeming more spectacular than the previous one. The clean desert air, combined with the elevated vantage point afforded by the turnouts allow you to see the hills and valleys for what seems a hundred miles. There are hiking trails along the way that will allow you to explore the area much more thoroughly than if you simply stayed in your automobile. 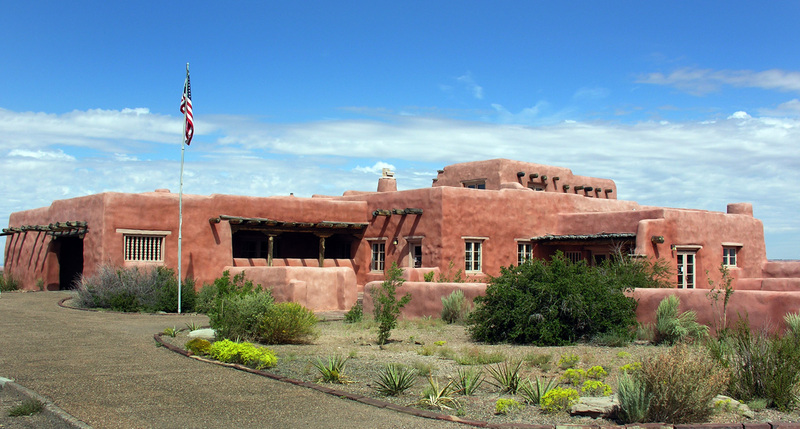 Soon you will arrive at the Painted Desert Inn National Historical Landmark, which is well worth exploring. 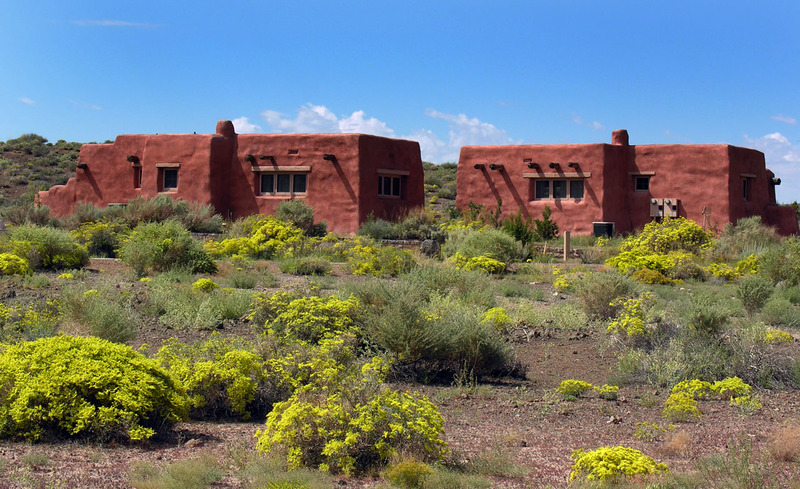 Across the road from the Inn are additional service buildings, built in the same Pueblo style as the Painted Desert Inn. Visitors are welcome to enter the Inn, where you can see the wonderful architecture and decorating that make this such a special place. 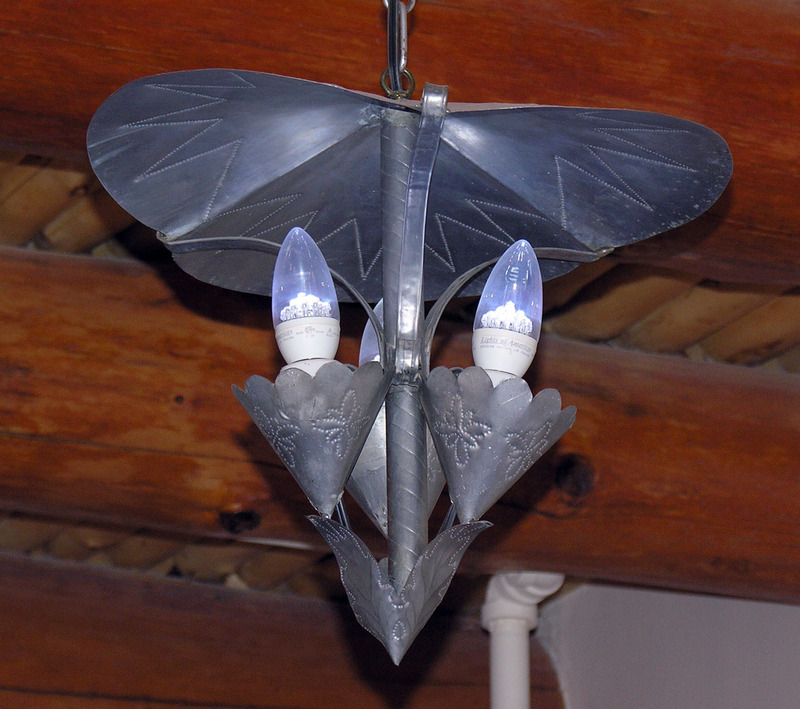 It is worth the effort to search for the little details that make this place unique, such as this hand-crafted light fixture in the bar area. 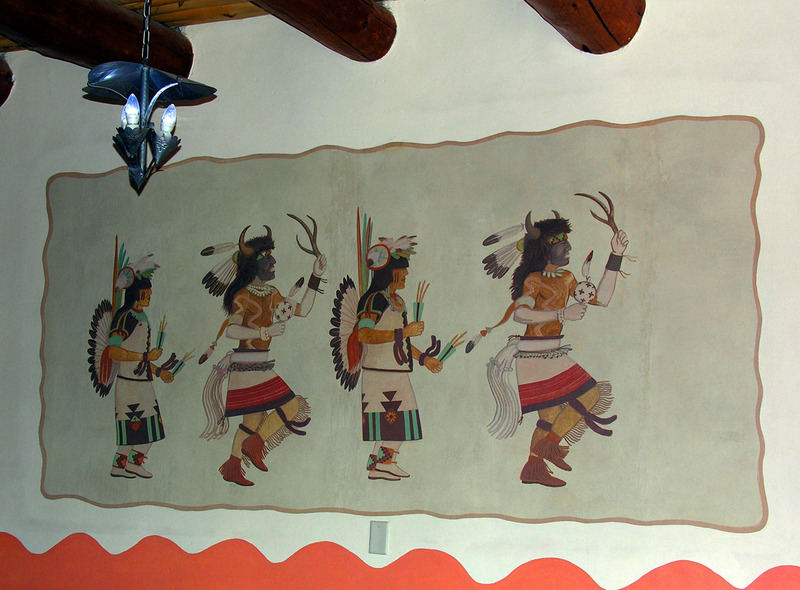 This mural depicts the dance and ceremonial costumes of the Native Americans from the region. 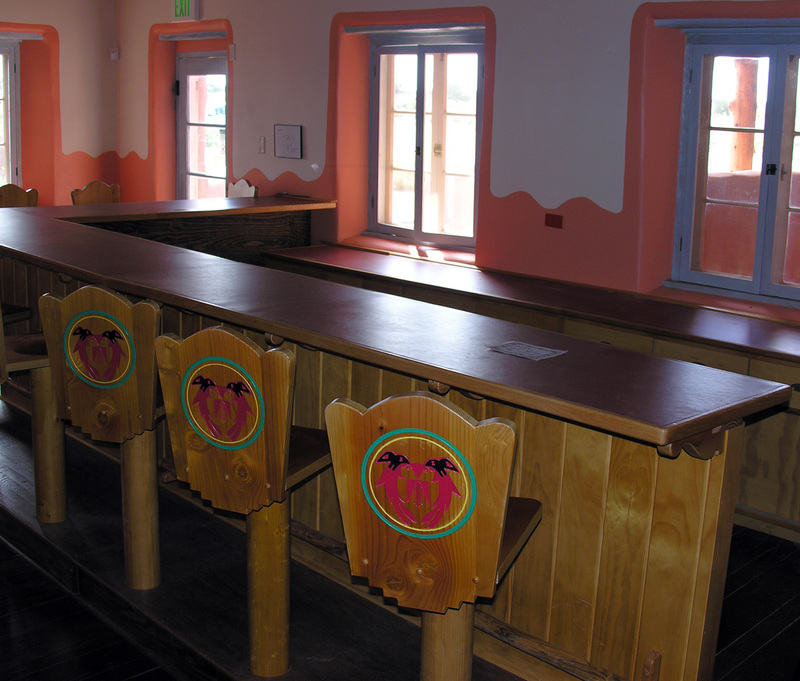 You will find similar artwork throughout the Painted Desert Inn. 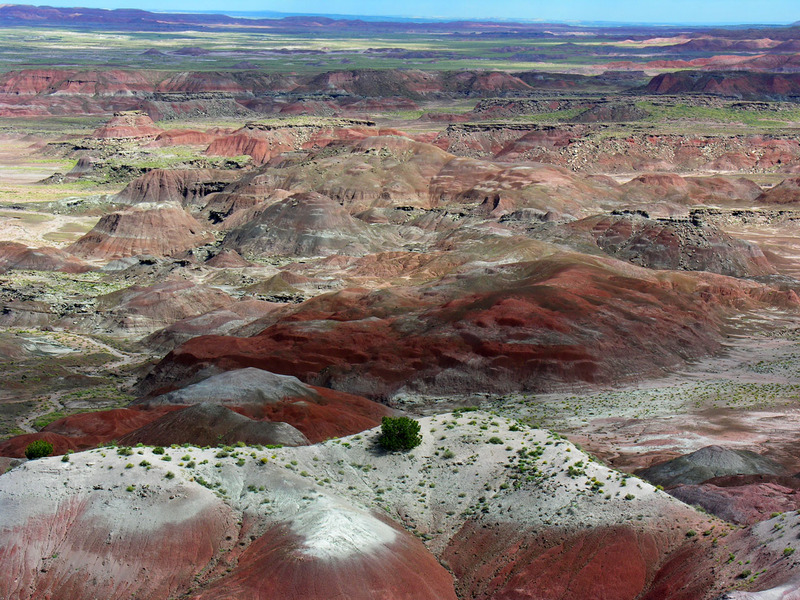 The starkness of the landscape contrasts nicely with the beauty and colors of the barren, rocky hills. I can only imaging what this entire area must look like in the evening alpenglow. Even in the flat, monochromatic lighting of the mid-day sun, the colors pop out at you, daring you to take photograph after photograph. 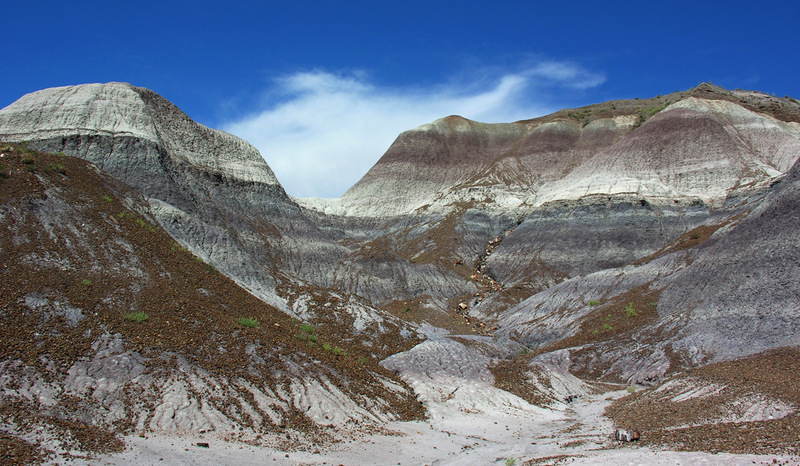 The jagged landscape appears as if someone had picked it up and crumpled it in their hands. 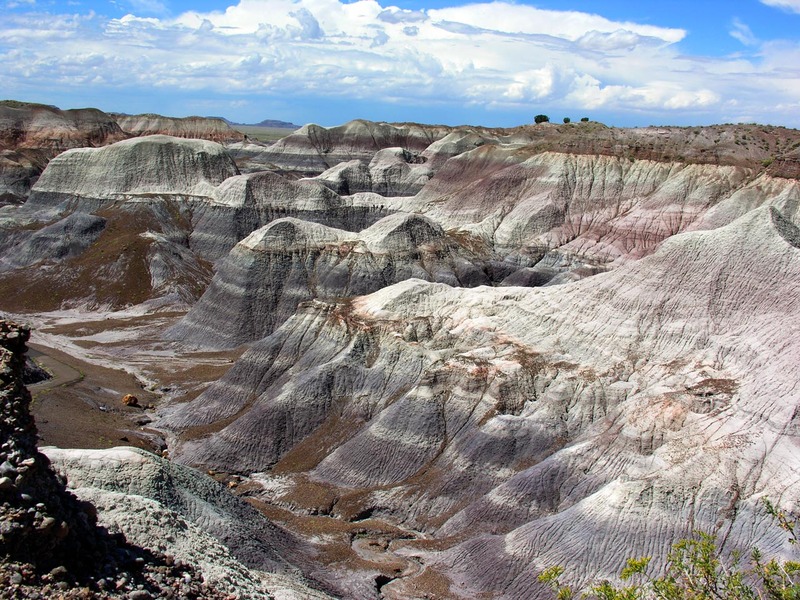 Can you imagine early travelers attempting to traverse this region? 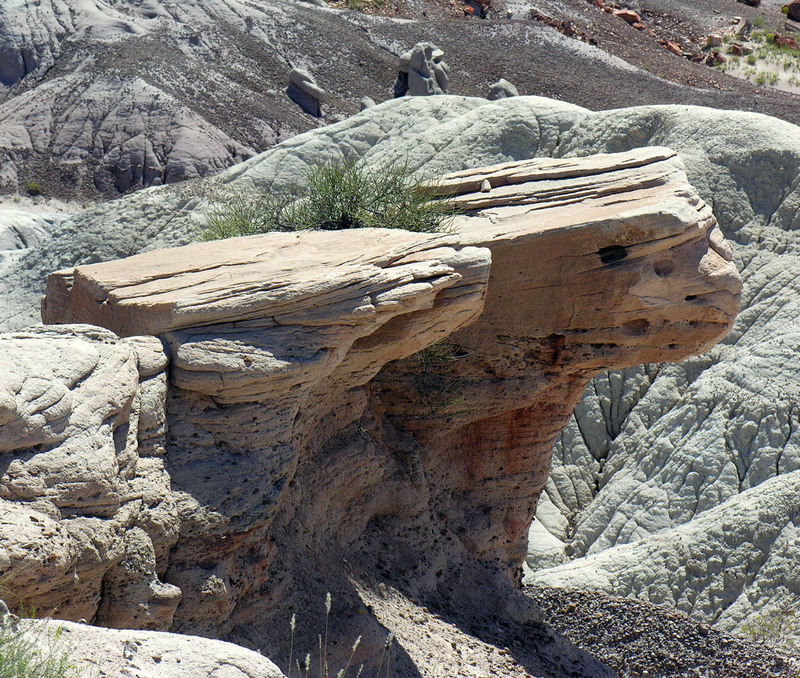 The perceptive tourist will notice the varied and unusual rock formations that seem to occur whichever way one looks. Combined with the wildflowers, they make excellent photographic subjects. 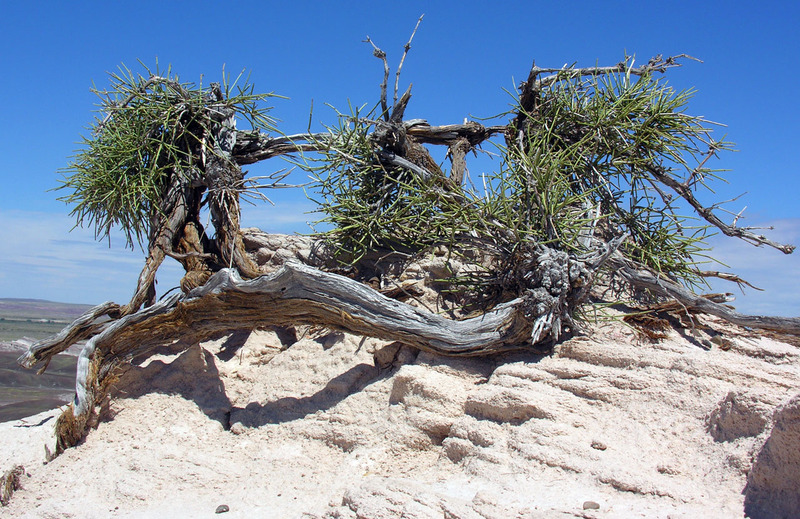 Besides the isolated rock outcroppings, there are many examples of cacti and desert vegetation managing to eke out an existence in the hot, arid desert climate. 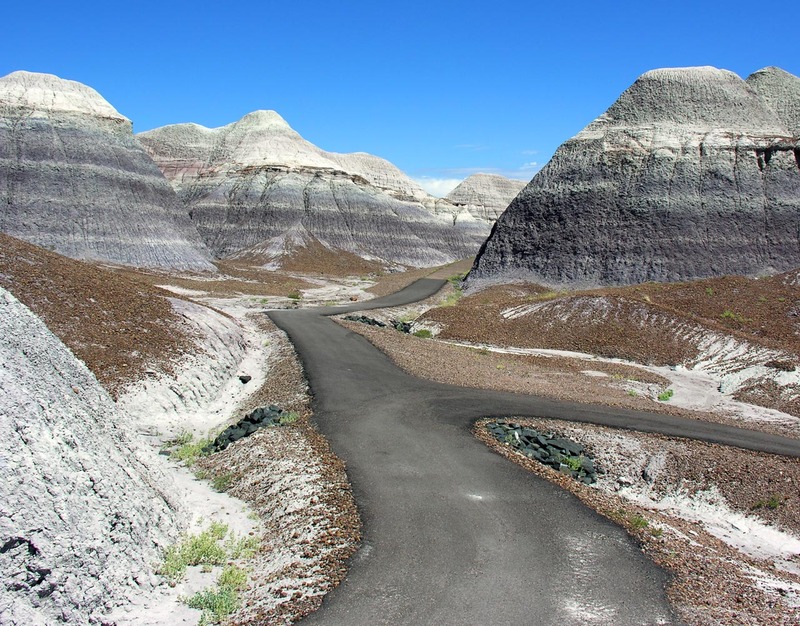 This area of badlands has a nice paved pathway that makes for pretty easy hiking. 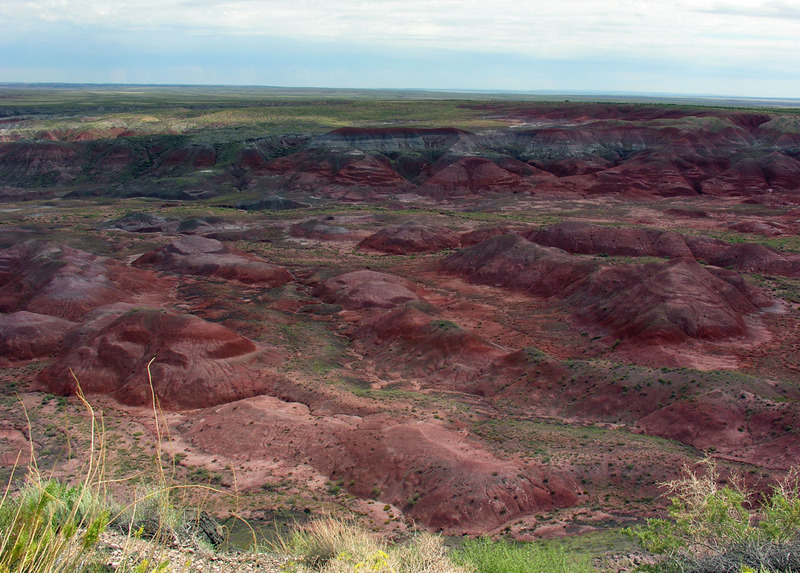 It is a great way to stretch your legs from all the driving you might have been doing along Interstate 40, and allows you to see the details that make up this terrain from close-up. 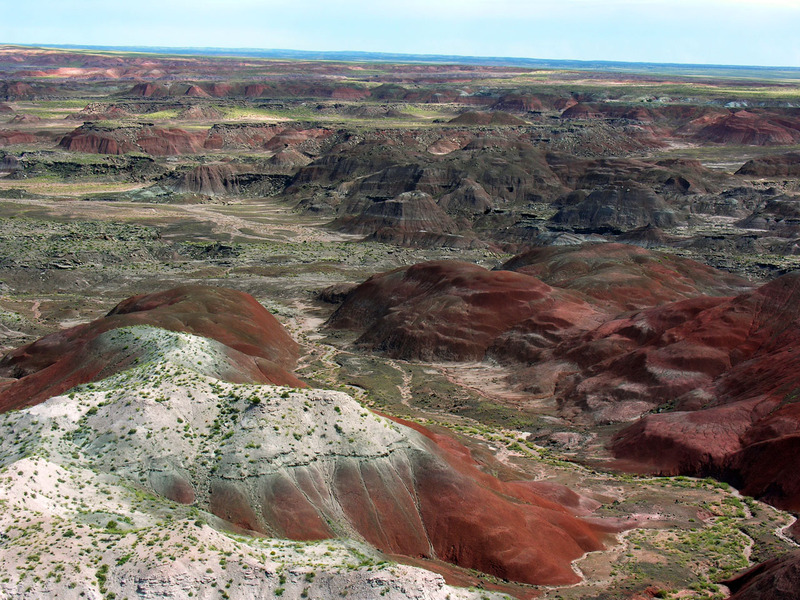 The colors in these badlands seem to change minute-by-minute, particularly when the clouds dance along in the sky above. 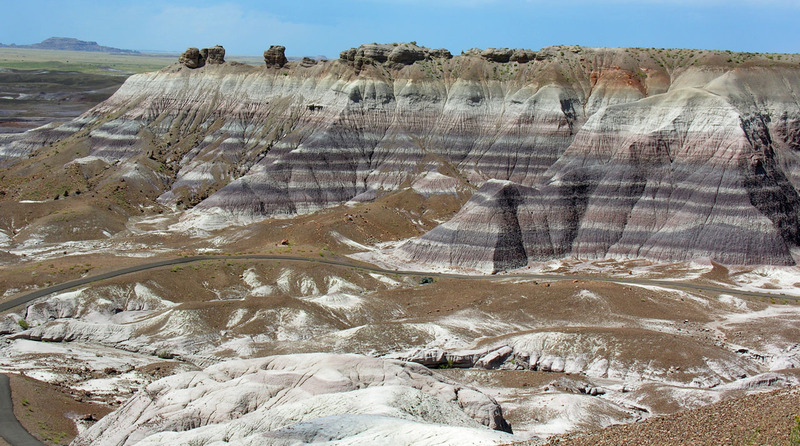 The trail through the badland canyons is paved, as you can see here. This is the only section of the trail the really causes physical exertion, so take it slow and easy here. The rest of the trail is relatively flat, making it easy to hike. I witnessed tourists of all ages and conditioning walking along the trail, so don’t be hesitant to give it a try. 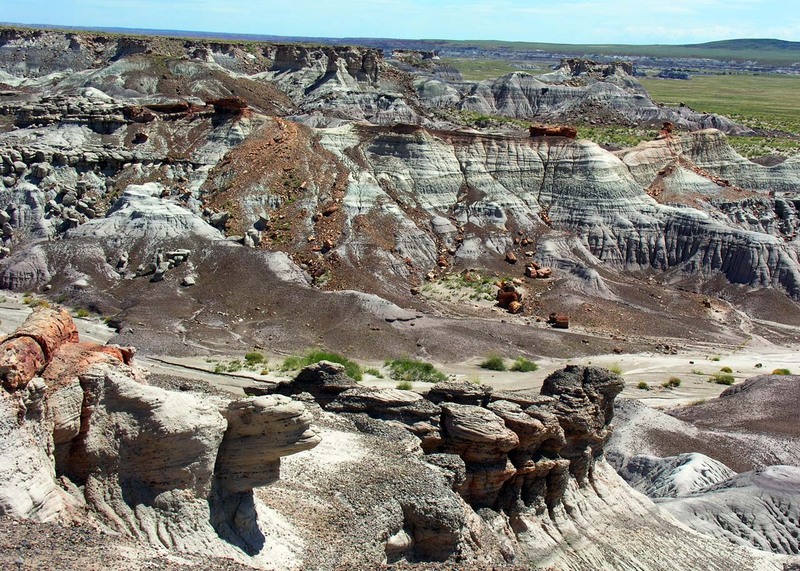 One thing you notice as you walk the badlands trail is that the scenery looks entirely different from the bottom looking up, as opposed to looking down on the badlands from above. As you can see, I wasn’t pulling your leg when I stated that the badlands trail flattens out at the bottom. The views along this section of trail are great, and you can enjoy a leisurely stroll as you partake of the picturesque scenery before you. From this vantage point near the top of the trail you can see how the paved path wends its’ way through the canyon. 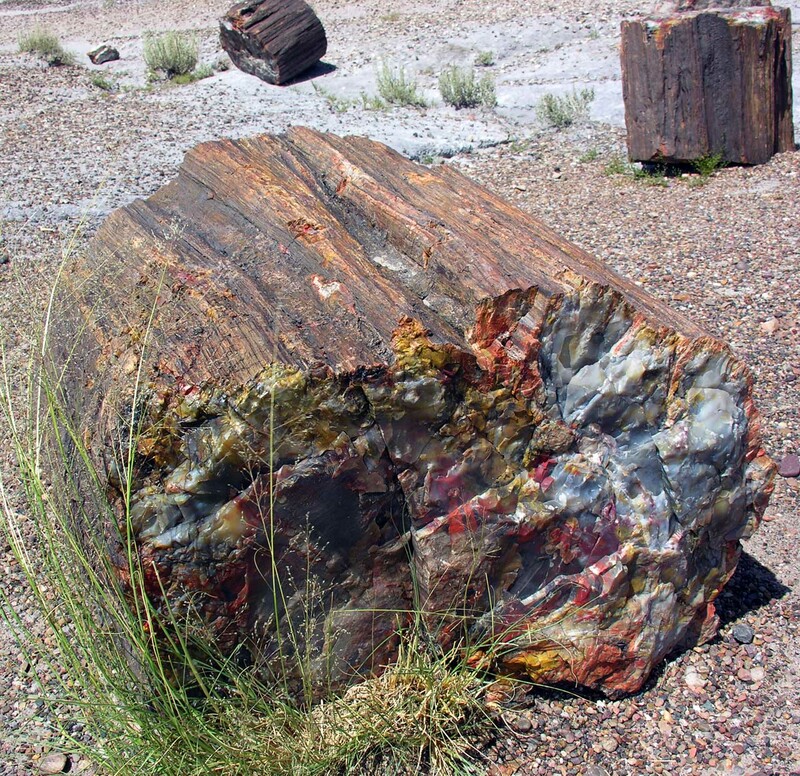 After returning to your automobile and heading south again along the park road, you will finally arrive at areas that contain the stars of the park, namely the petrified wood (interchangably called petrified rock). These photographs were taken in a section of the park called the Crystal Forest. 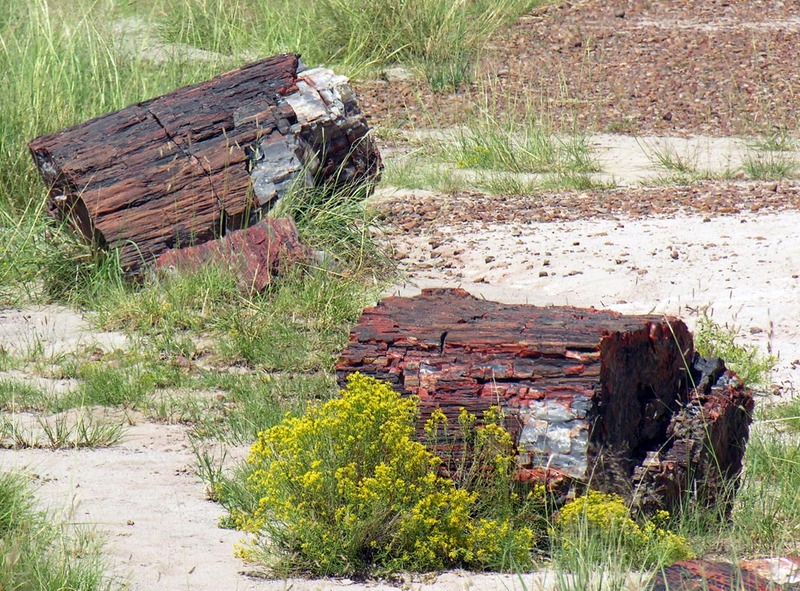 As you amble along the paved trail you will come across hundreds of pieces of petrified wood. 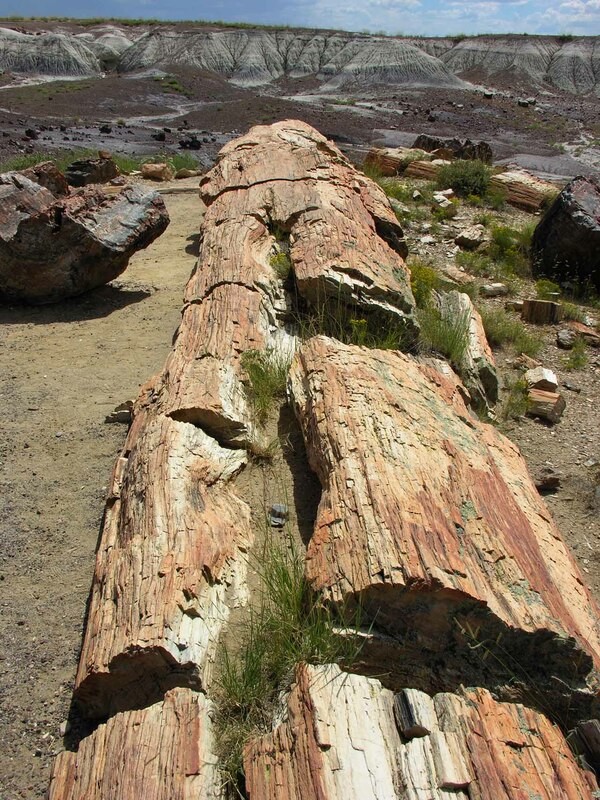 Although it is called petrified wood, it is not wood at all, but actually stone. 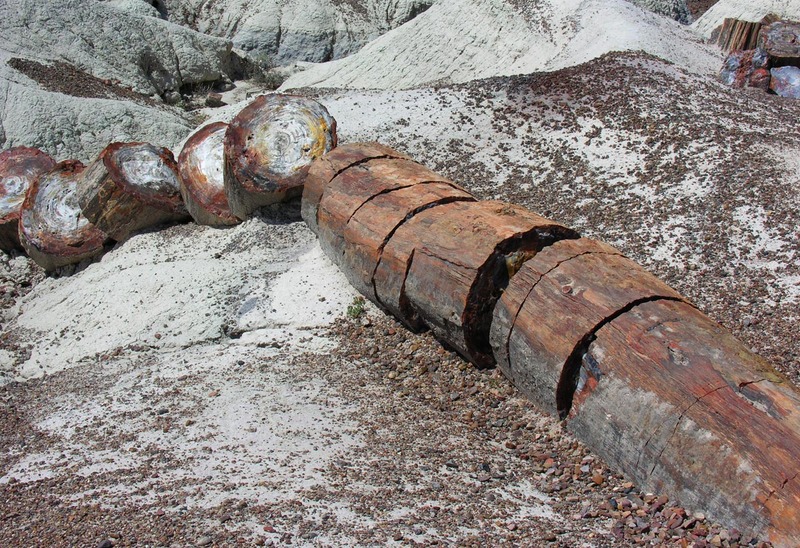 It once was wood, as these were formed by the permineralization of toppled trees. 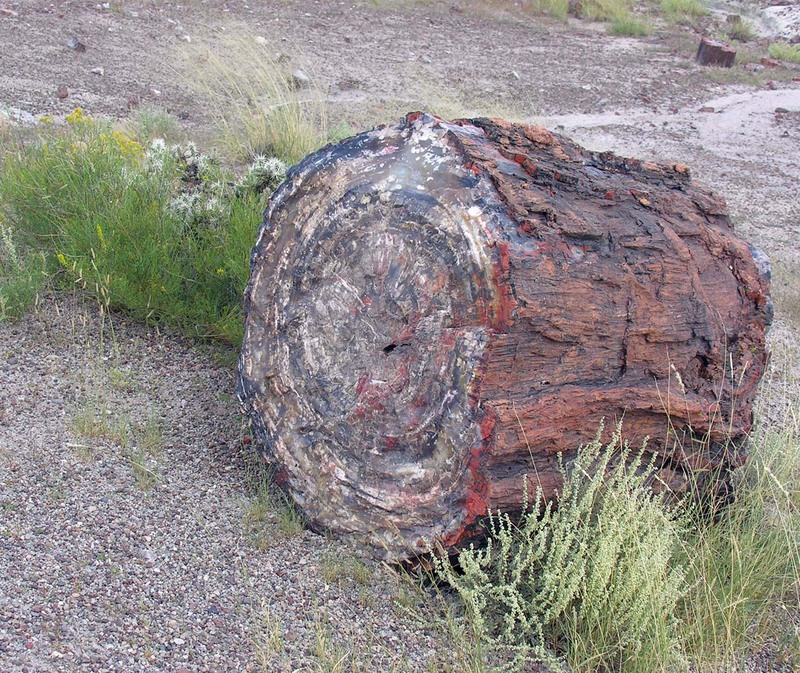 In an amazing process, the wood morphs into stone, leaving the rock in a shape that is exactly the same as the host tree that allowed it to form. 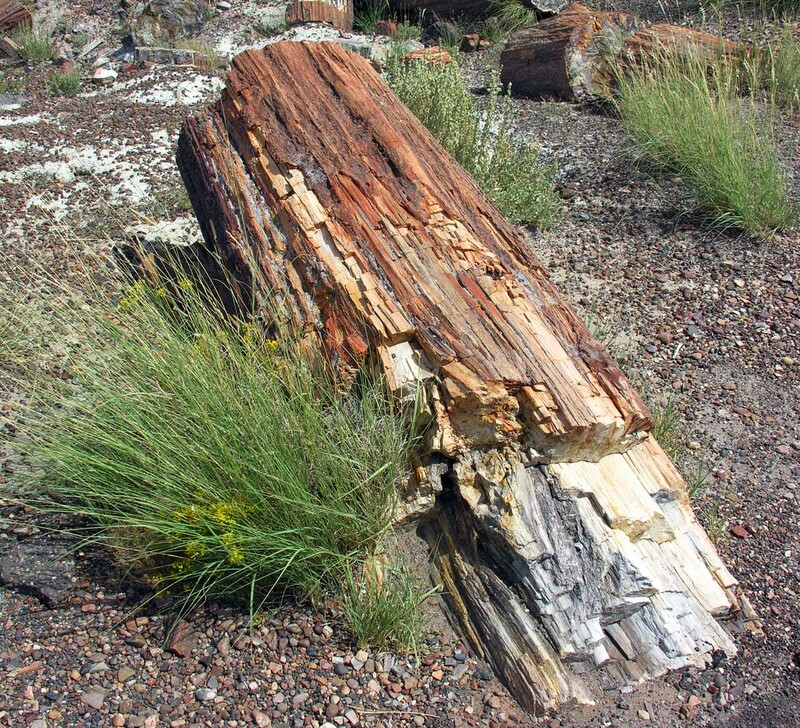 In this piece you can even see how the structure of the bark is apparent in the rock. 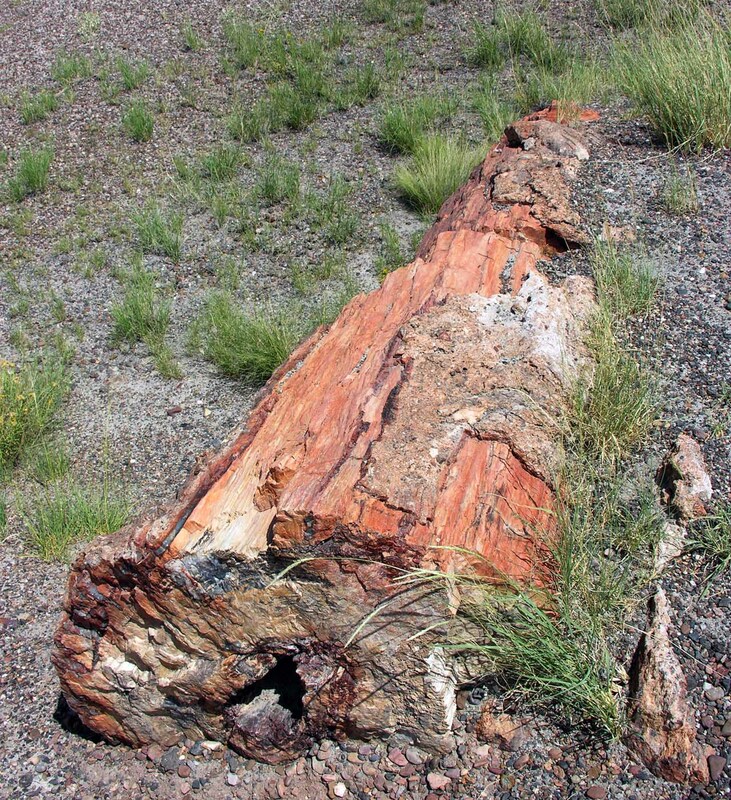 The photograph above clearly shows the host tree trunk that turned into stone long ago. It almost looks as if someone segmented the trunk with a stone-cutting chain saw. Again, a clear example of a tree-turned-to-stone. When the desert flora and cacti grow in proximity to one another, it creates a magnificent sight, as well as a great photo-op. 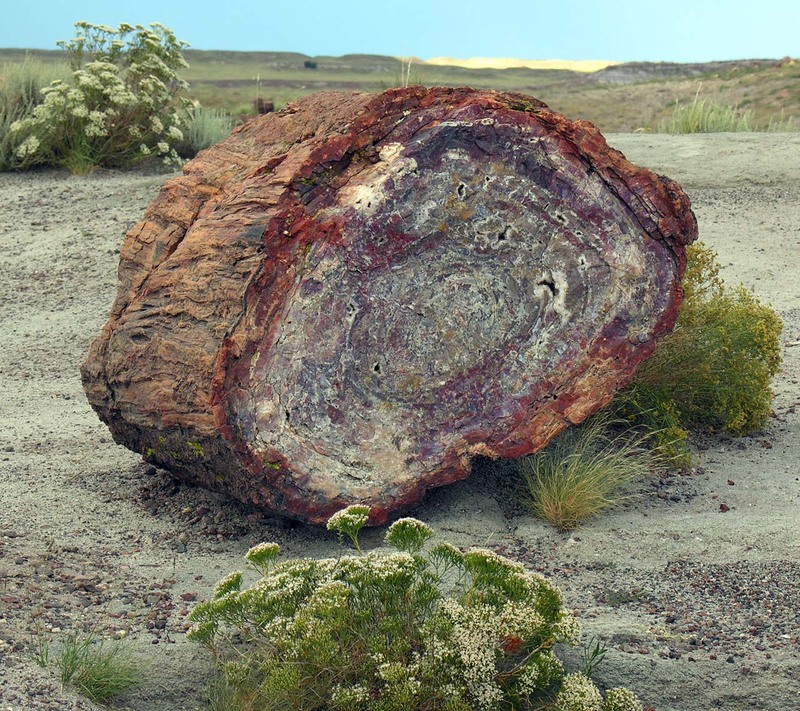 These pieces of petrified rock reveal the rings that existed within the tree trunk, and which have been preserved in the permineralization process. 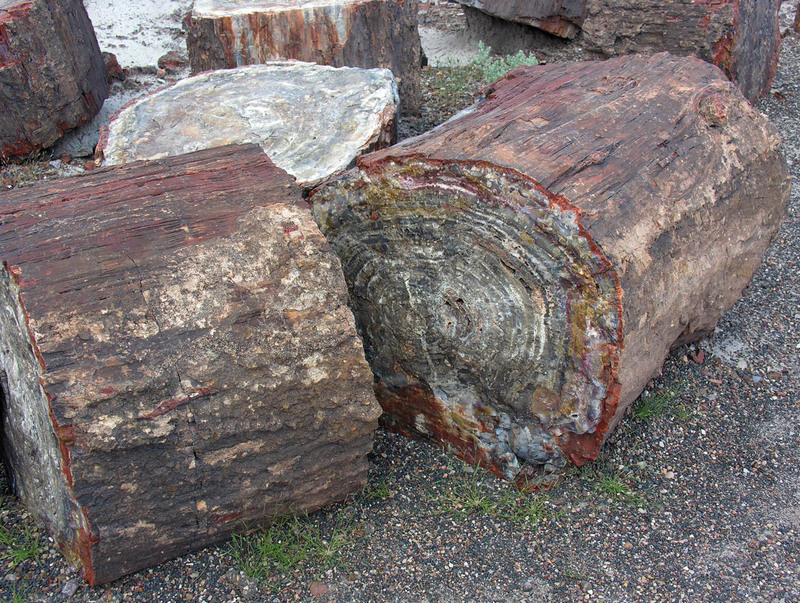 This segment evidences both the rings of the former tree, as well as the bark on the outer surface. 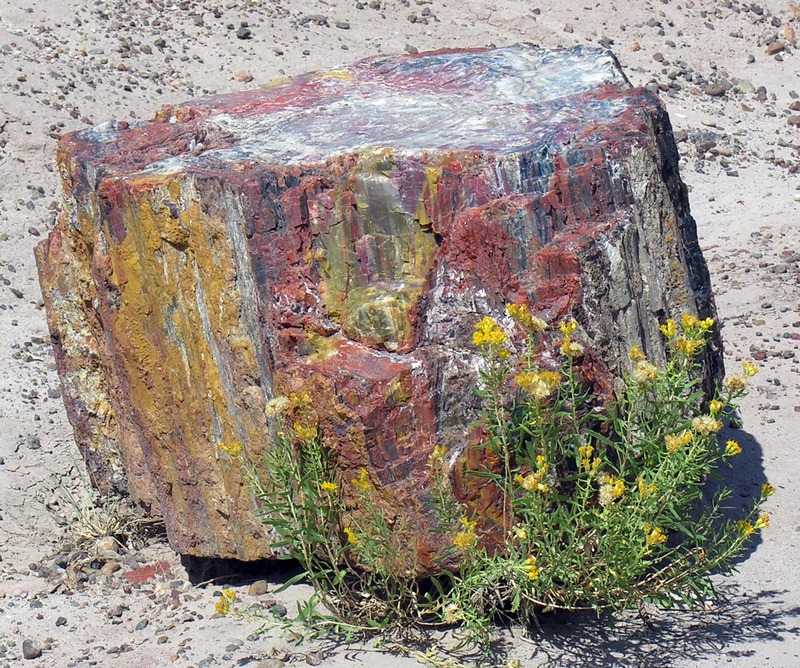 The sections of petrified rock above and below show the coloration that the stone takes on as it morphs. 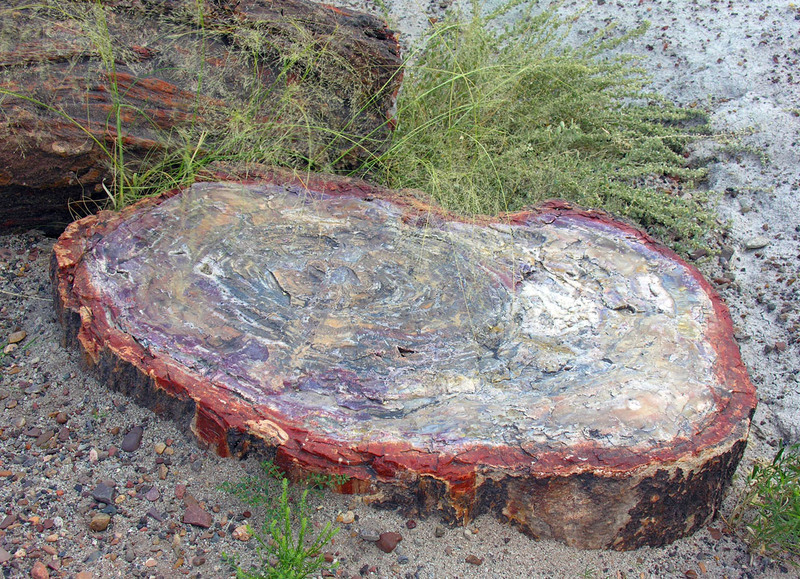 In the gift shops outside the park, one can purchase pieces of petrified wood that have been harvested from private land outside the park. 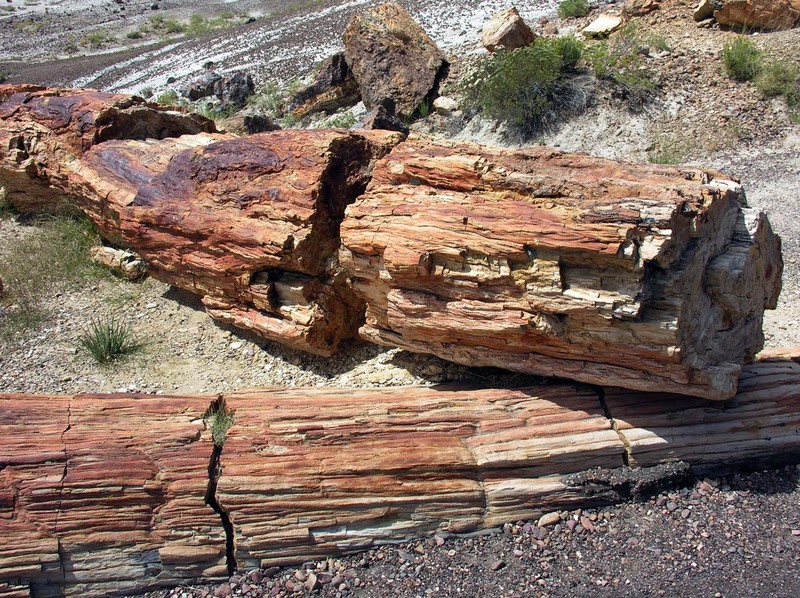 The pieces that are for sale are usually cut smooth and polished, creating a shiny, colorful piece that makes a beautiful display in ones’ home, and becomes a wonderful momento to remind you of your visit to Petrified Forest National Park. 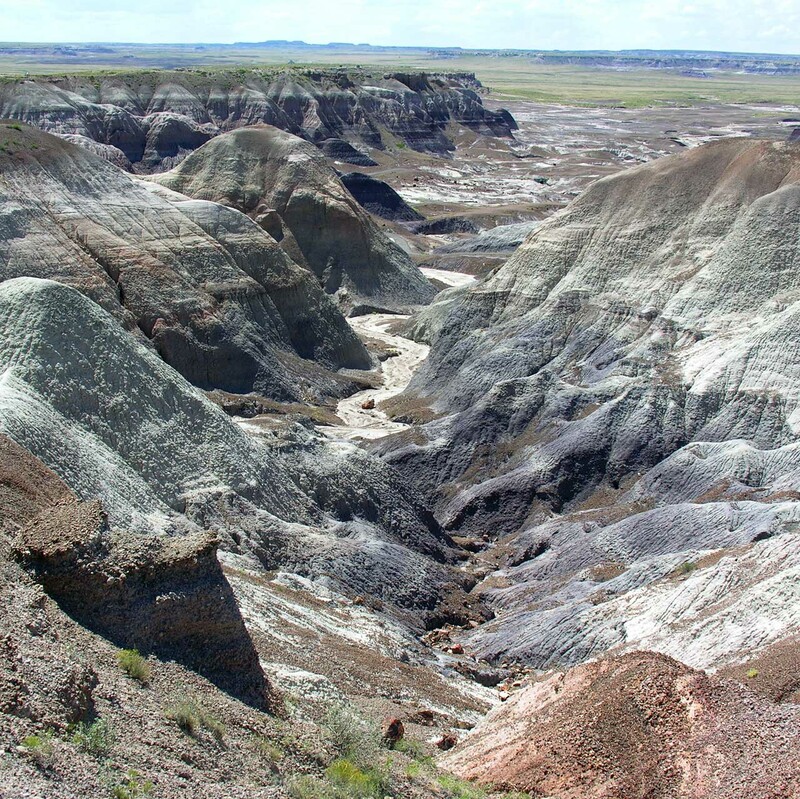 In closing, I would whole-heartedly recommend a visit to the park, preferably with enough free time to hike along at least one of its’ many trails, and to savor the spectacular scenery that only occurs here.